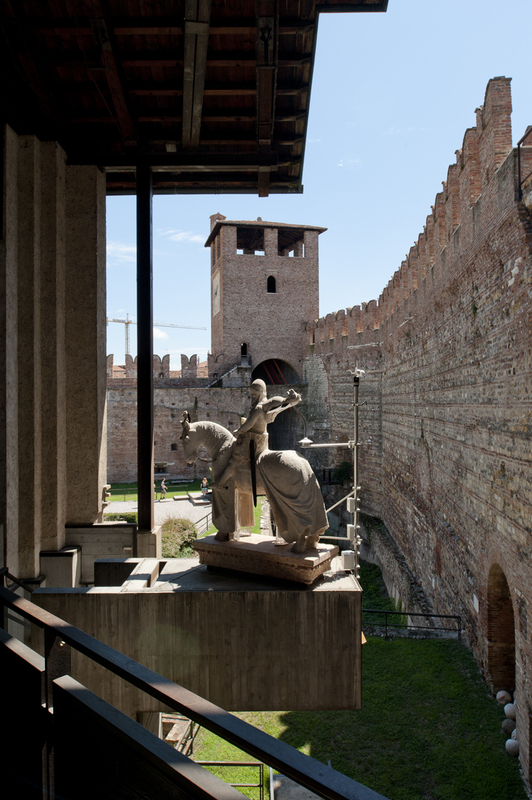 In my last post, I featured a few images of the exterior of the Castelvecchio in Verona. 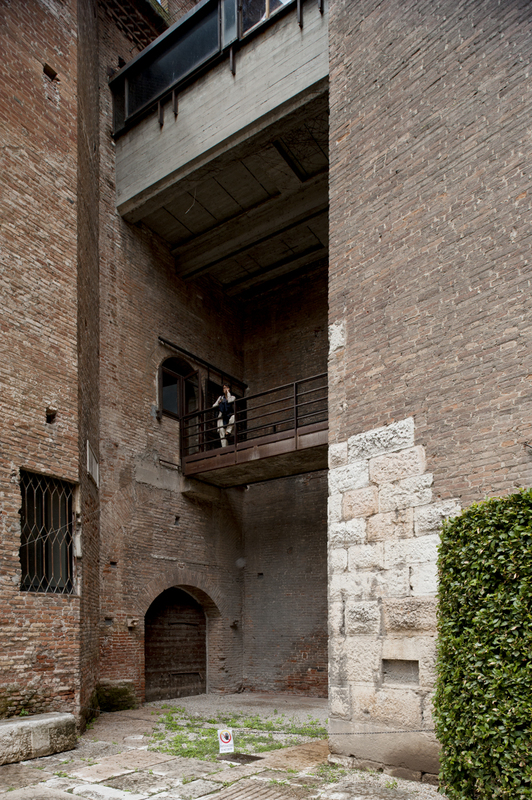 For this post, I’ll focus mostly on its interior, and show a few images of another Scarpa building in Verona, the Banca Popolare di Verona (which I was unfortunately forbidden to enter). As a disclaimer for those that get bored with images of buildings, this post may be a little architecture-centric. Not to worry, though, I still have a backlog of two more posts after this one, which I will be publishing in the next few days. 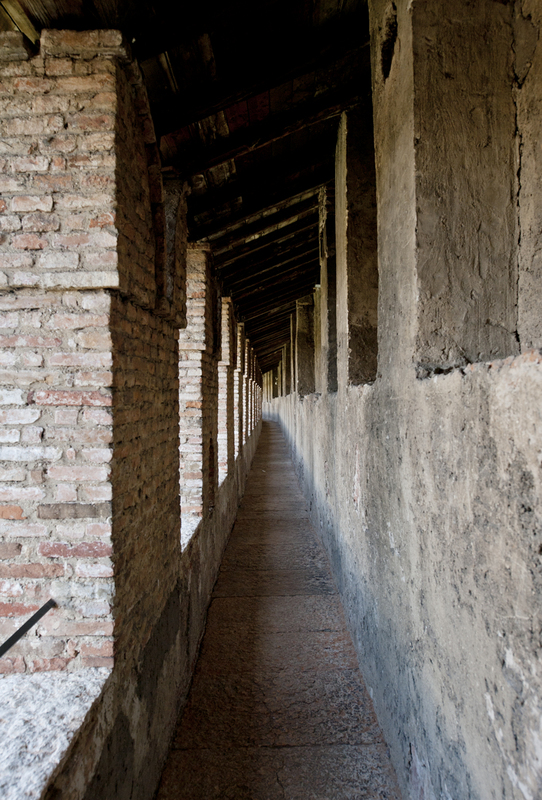 Castelvecchio was built in the middle of the 14th Century by Cangrande II, a ruthless local ruler, and after Verona fell to Napoleon, and then the Austrians, it was further used as a barracks and for ammunition storage. In the Fascist period, it underwent a number of renovations that restored it to a version of a Medieval castle that designers at the time thought appropriate, converting it into a museum. However, some strange moves were made, like salvaging gothic windows from nearby houses for use on the facade of the former barracks. The castle was bombed during World War II, and was afterwards again restored similarly. 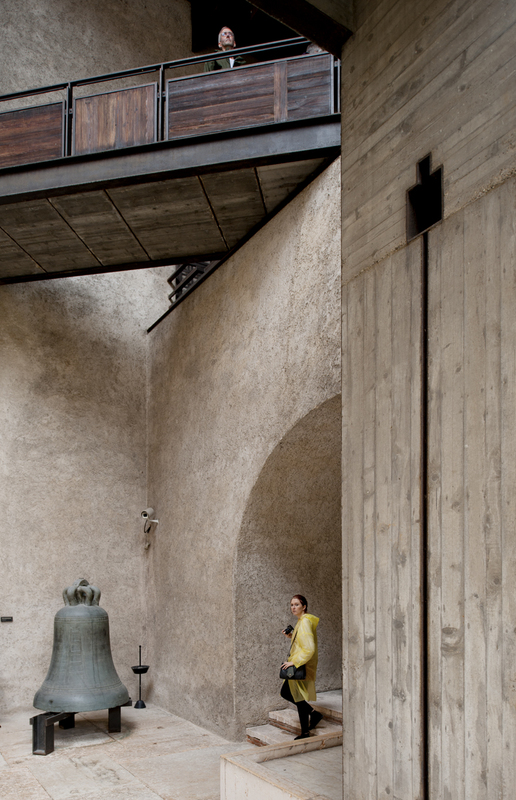 In the 1960s, a progressive museum director was hired, and he soon hired Carlo Scarpa to renovate the entire museum complex. 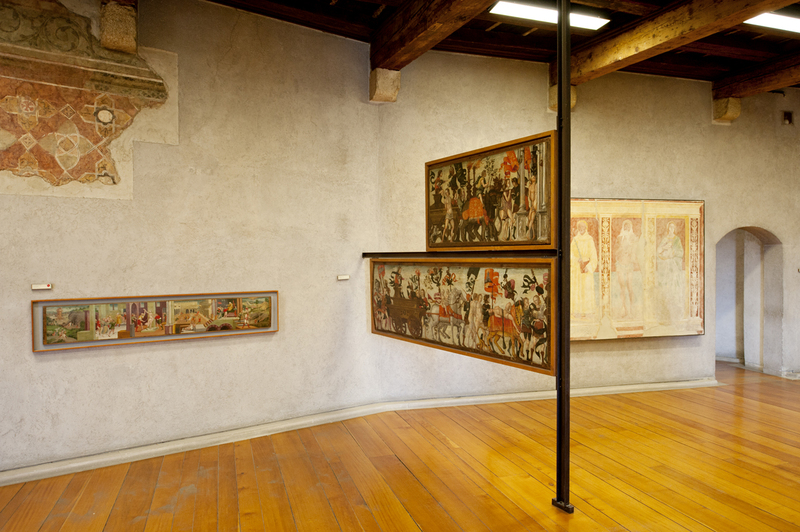 According to Scarpa, when he was hired, the Castelvecchio was completely fake. The previous renovations of the past forty years were fantasy constructions to make the place appear like an intact medieval castle. Damaged frescoes, which were missing large chunks, were filled in, and all of the new work done was designed to blend in with the old. 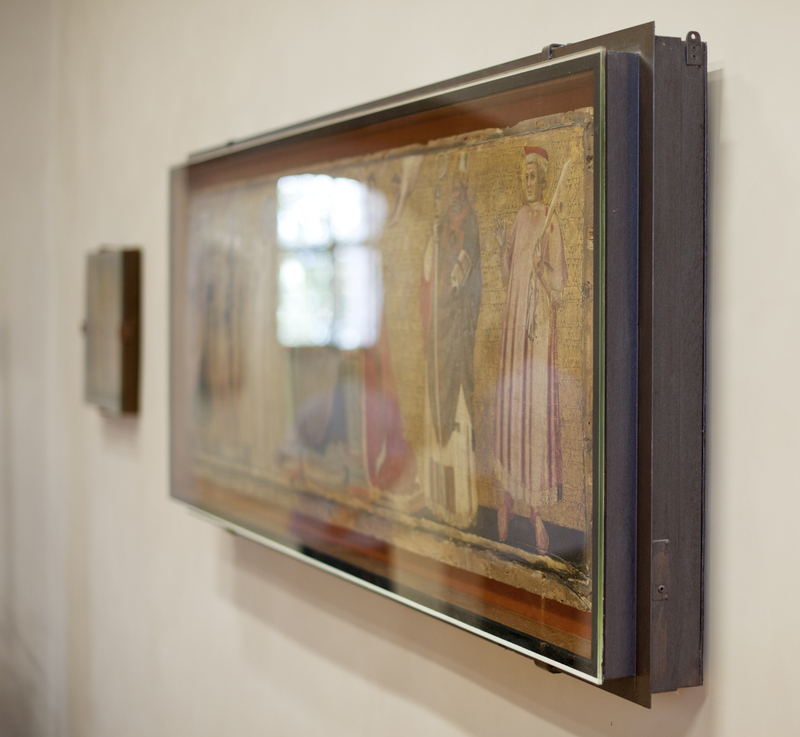 Artifacts and paintings were displayed how some curator thought they might have been hung in the fourteenth century. Rather than continuing in this mode, what Scarpa did here was quite revolutionary at the time, and remains influential to this day. His concept was to expose the various layers of construction, and to clearly delineate new interventions from old. Although subtle by today’s standards, his introduction and celebration of concrete and steel within the brick and stone walls of the castle was groundbreaking. 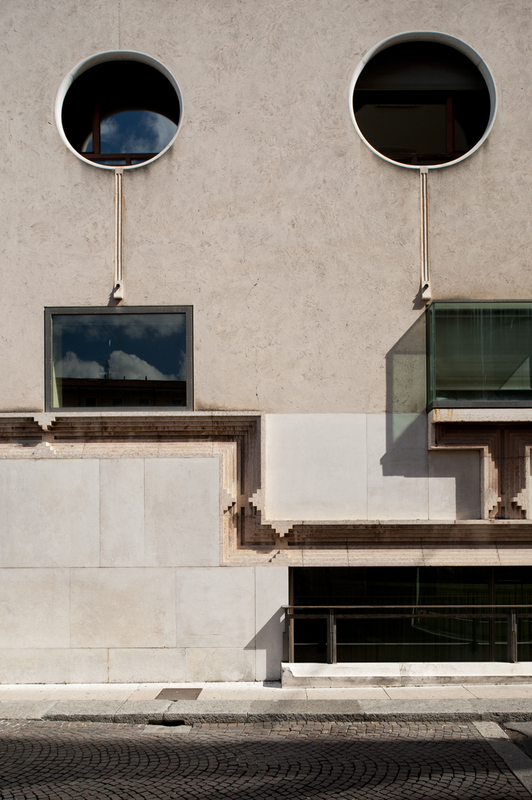 Rather than attempting to blend in with the existing building, his details clearly separated his work form the old, almost making it float above in some cases. 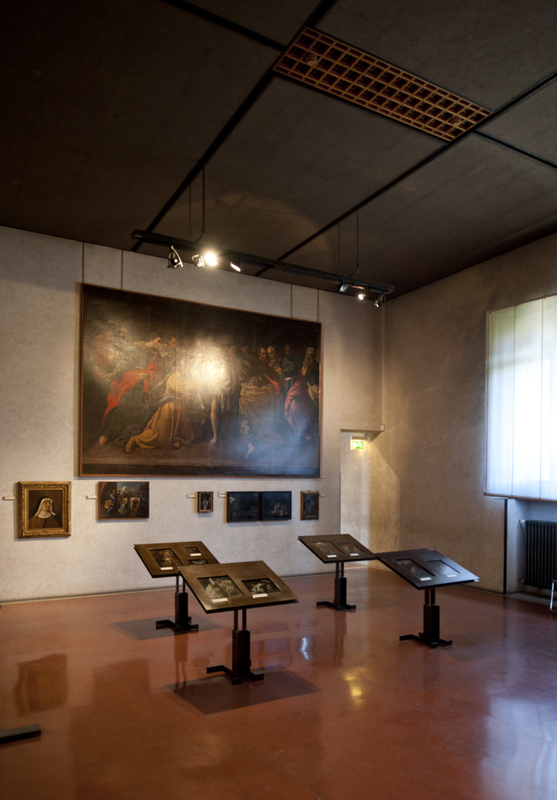 In the sculpture gallery, Scarpa left the backdrops spare. One of his consistent obsessions was the connections between different surfaces. 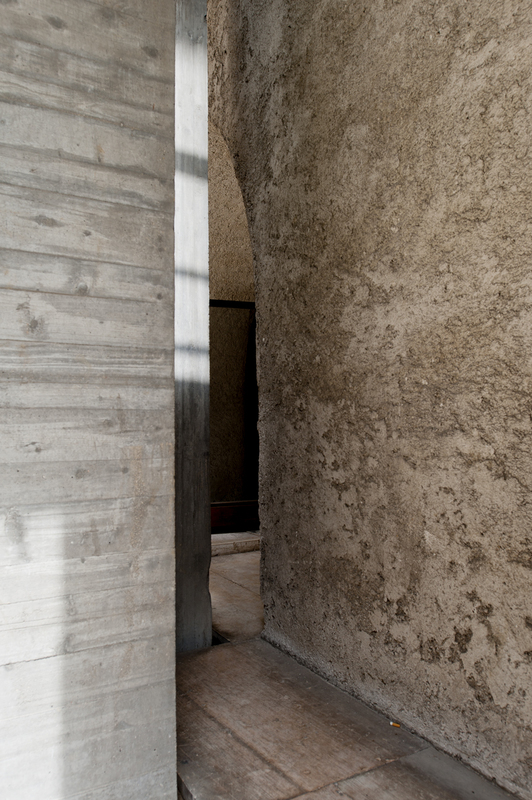 Here, the concrete floors are rimmed with a limestone channel at the joint with the vertical walls, which accentuates the relationship between existing and new. 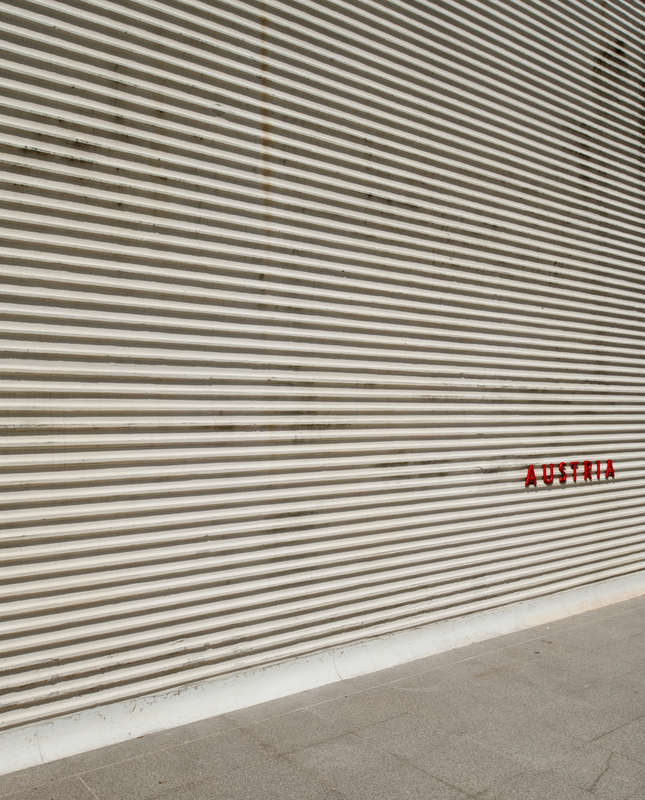 The space towards which this woman is walking, off of the sculpture wing, is the only modern appendage that penetrates the facade. Called the Saracellum, it sits as a pristine box in the interior garden, and brings natural light from above to highlight medieval artifacts from the castle's original inhabitants. Notice how Scarpa challenges the symmetry of the window above (the faux non-original gothic windows mentioned at the top of the page). 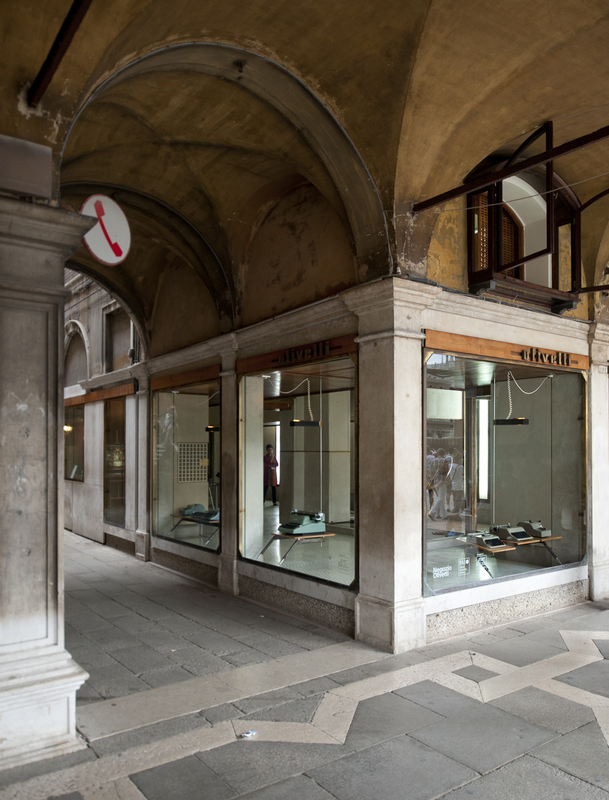 Not only did he design the renovation, Scarpa also designed every display stand in the museum. 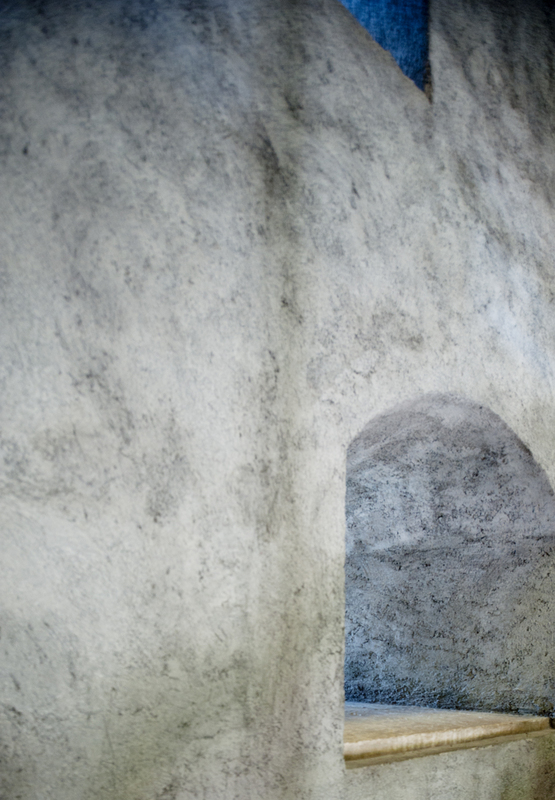 Here, the Master of Sant'Anastasia's crucifixion group gets the Scarpa treatment. Also notice connection between ceiling and walls, where a small shadow-line is created. Also of note is the steel girder that spans in the direction of movement through the galleries, which is offset form the ceiling. 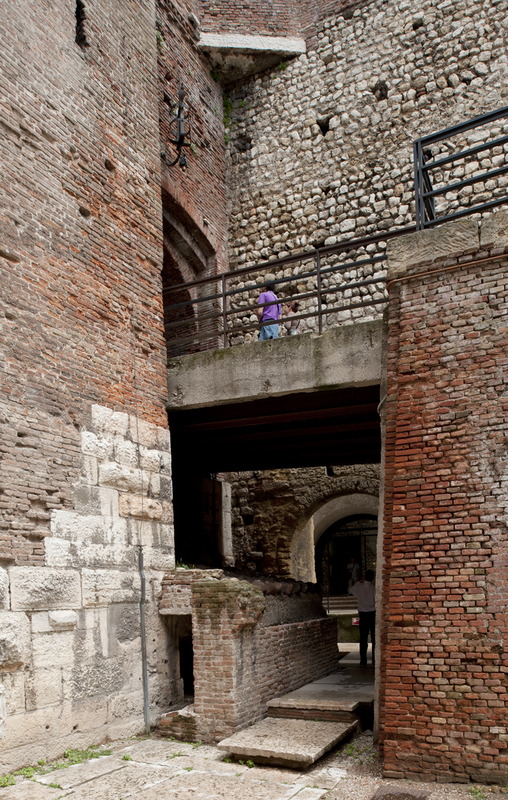 At the pivotal intersection of the east and west wings of the castle with the ancient town walls and bridge, Scarpa demolished a portion of the rebuilt east wing, and created this area, where all of the circulation paths come together. The focal point is on an equestrian statue of Cangrande, which is on display above. A variety of textures and building materials come together in this place. The wall that the bridge above penetrates is believed to have been an original town wall, which was later incorporated into the castle and bridge across the Adige (photographed in yesterday's post). The bridge across the Adige, which is open to the public, is accessed by the walkway above, which extends through the castle to the river. The museum circulation is under this bridge, and then above it later in the journey through the castle. 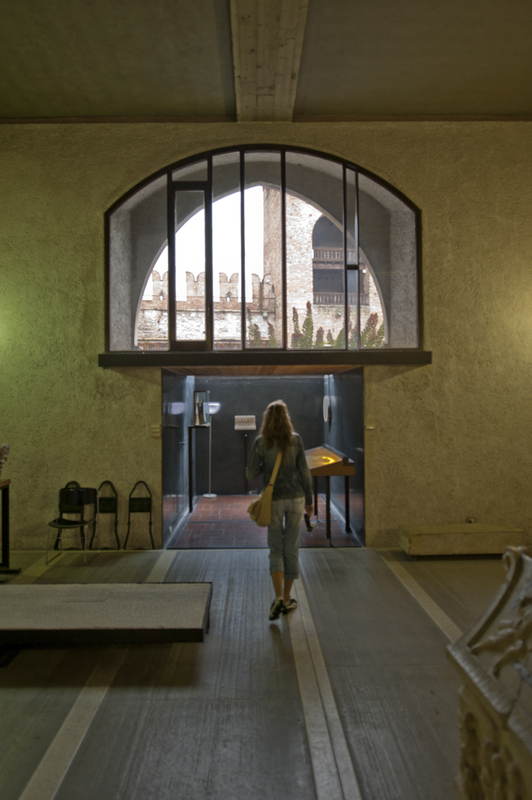 Museum-goers are constantly confronted with juxtapositions of old and new, interior and exterior, as they move through the complex. Each joint is an opportunity for expression. 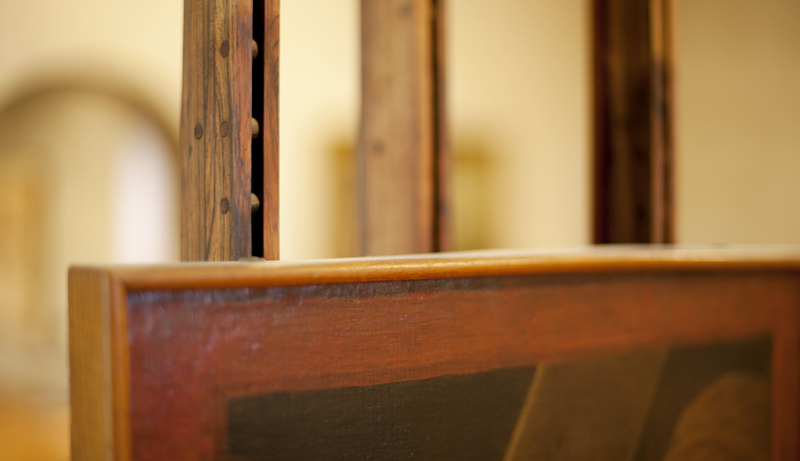 Notice how the direction of the wooden formwork was changed at this point. Back in the intersection with the Cangrande statue, each change of use, structure, or material is clearly delineated. 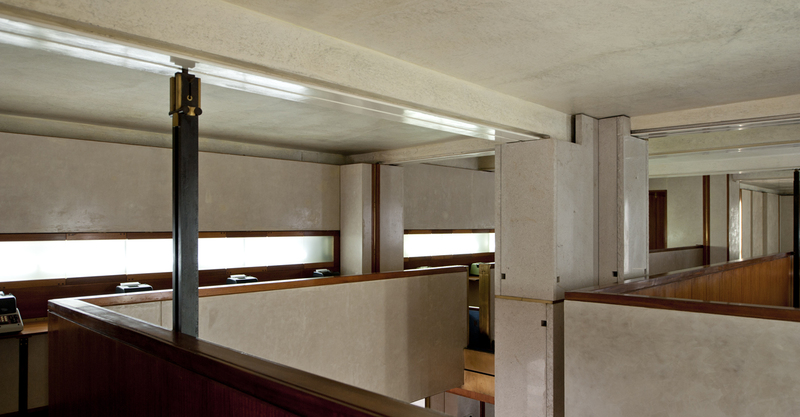 Again, textural changes were incredibly important to Scarpa. 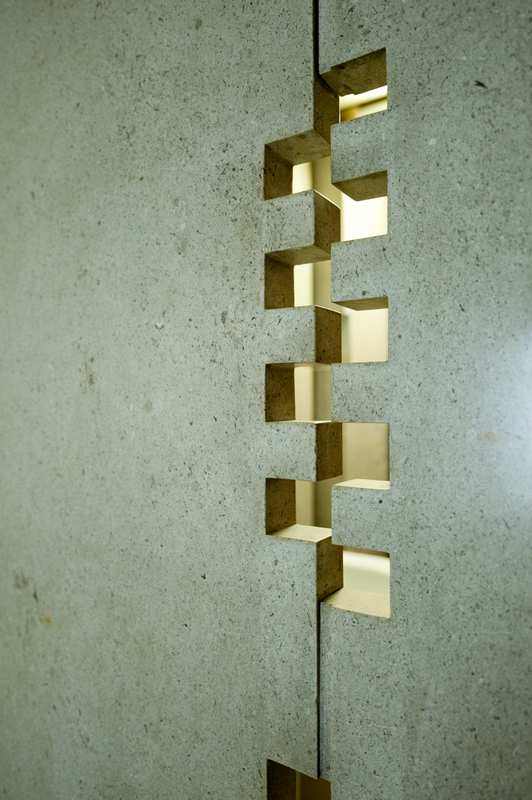 Notice how the sill, which is a slab of polished limestone, is inset form the edge, clearly expressing its difference. 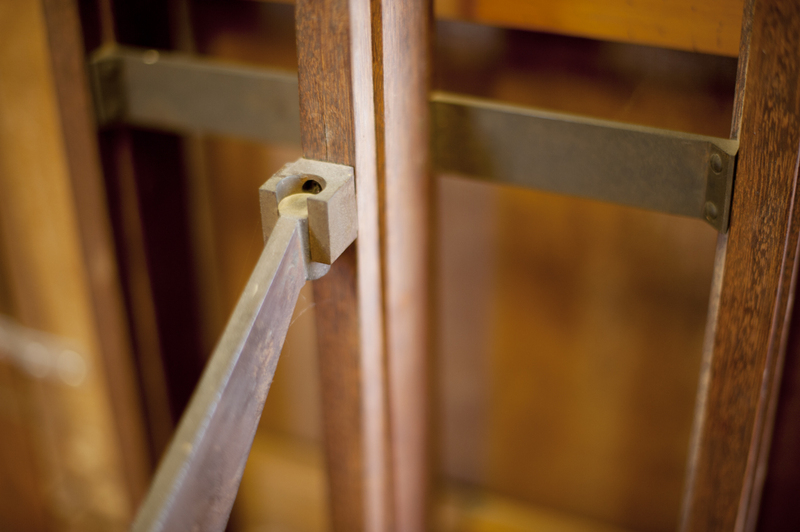 Scarpa also designed each of the frames, which are in stark contrast to those that are usually seen on paintings of this era. 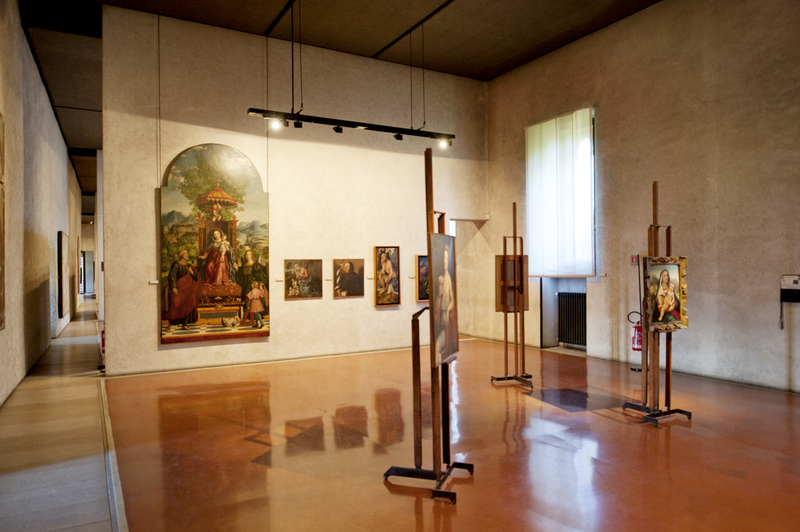 Rather than just hanging the paintings on the walls, they are displayed in three dimensions, taking advantage of certain natural lighting features, and also taking up the space of the gallery. 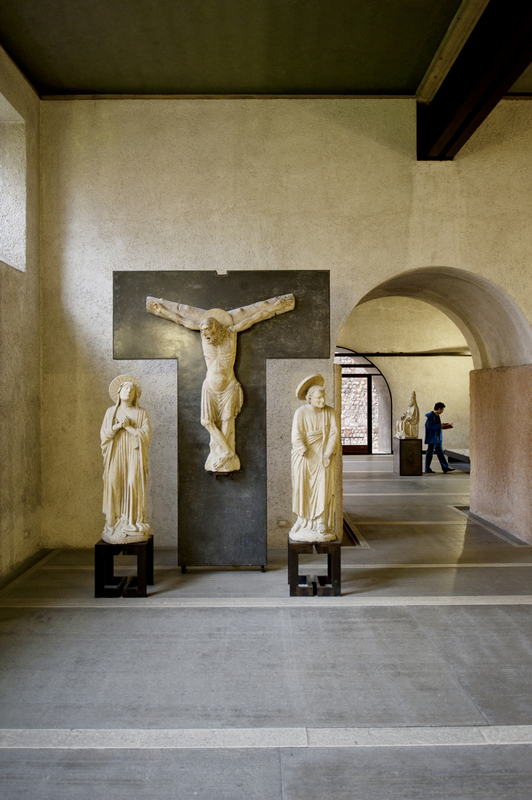 The frescoes on these walls were a source of particular consternation for Scarpa. They had been restored in the fascist period, and the gaps had been painted in. 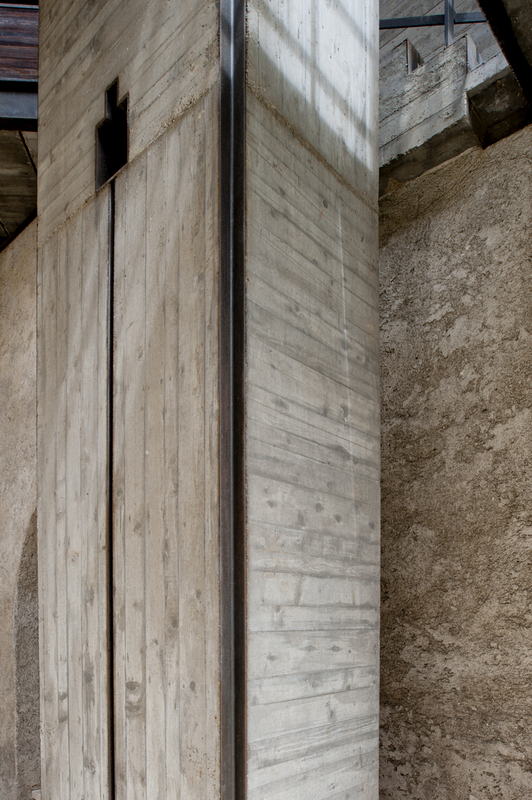 Scarpa meticulously removed any portions that were not original. Even with its human-inspired shape, I had trouble fitting through this door. What an unfortunately placed exit sign, presumably installed recently. 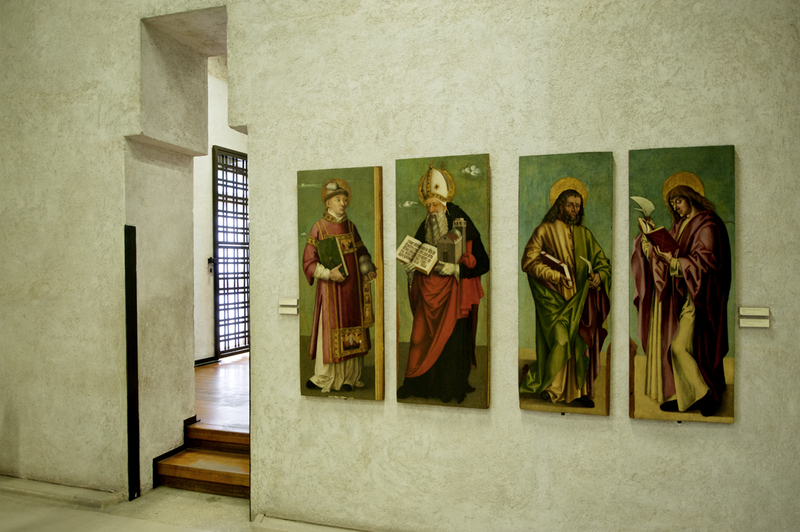 The altarpiece doors are hung by their hinges. Scarpa abhorred symmetry, which is exemplified by his placement and framing of Nicola Giolfino's Triumph of Pompey. Each detail was meticulously designed and crafted. 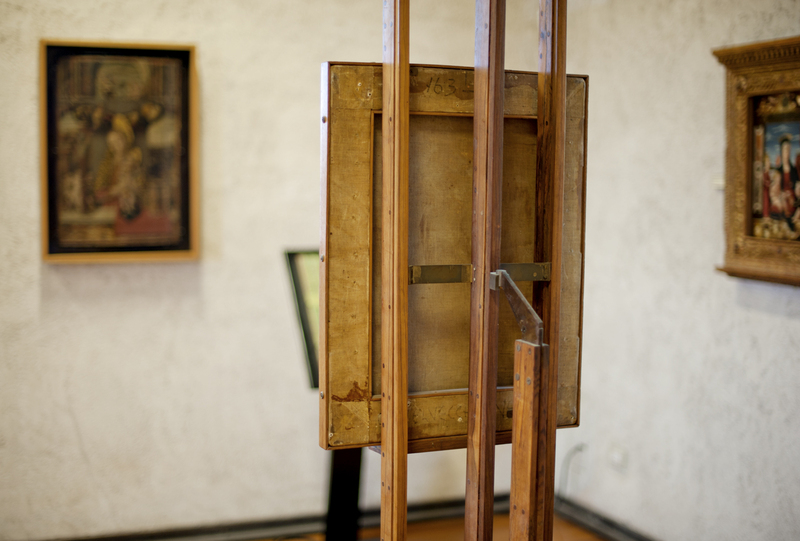 The easels on which many of the paintings are displayed were first used in the Correr Museum in Venice, and repurposed here. It was a surprisingly rare treat to see these canvases from the back. 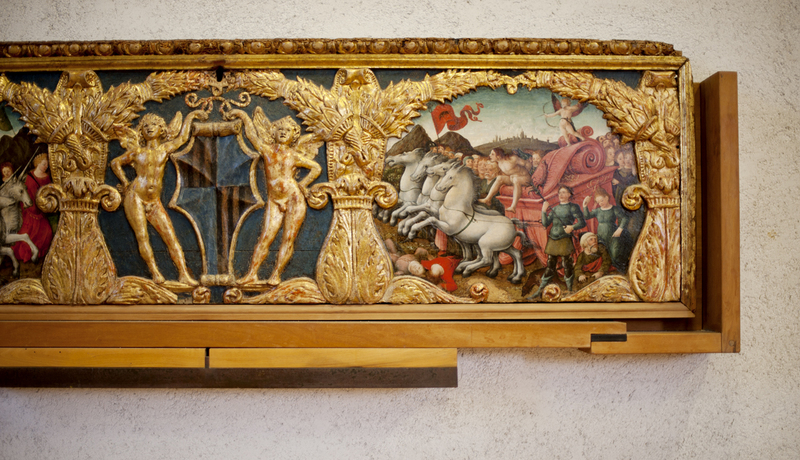 Altarpiece doors were meant to be seen in three dimensions. 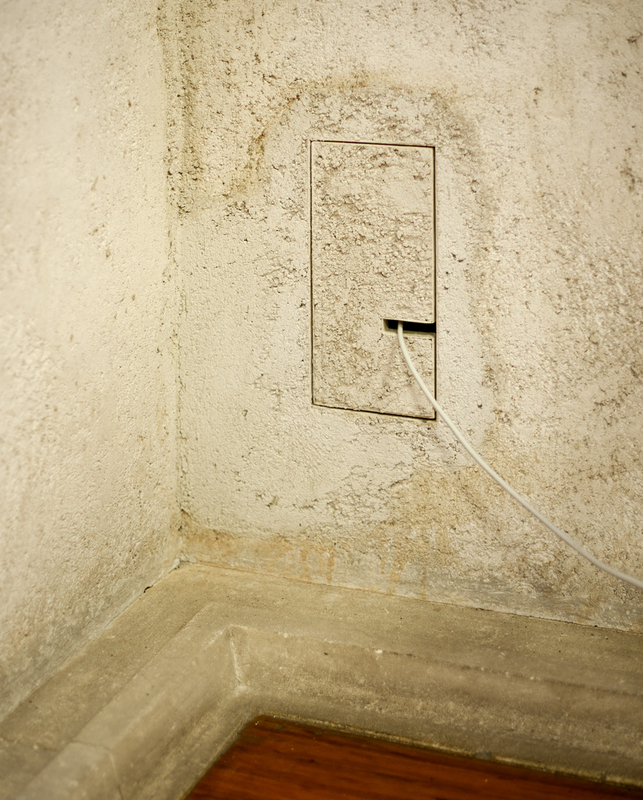 Not even the electrical outlets escaped Scarpa's attention. 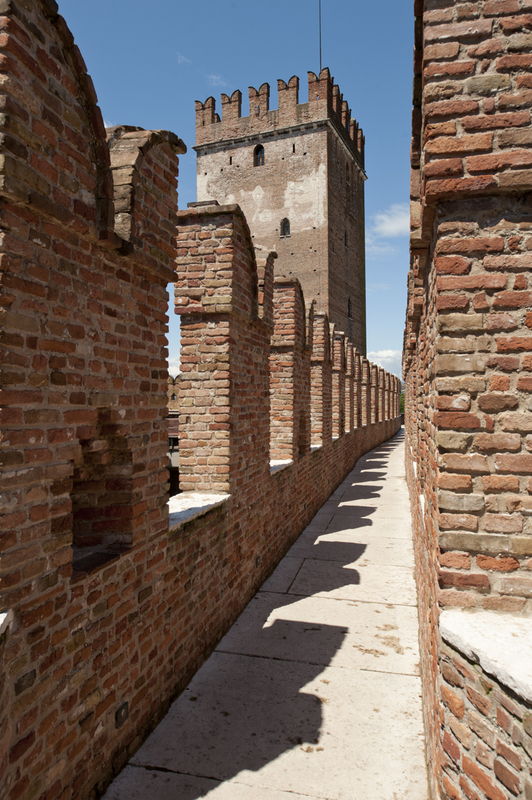 Artifacts are displayed on this bridge, which Scarpa inserted between two towers. The upper ramparts were only opened to visitors in 2007. 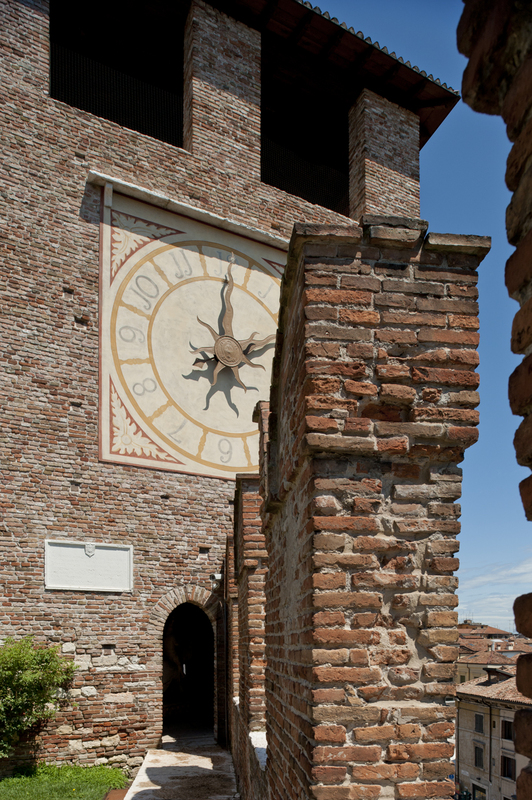 The clock tower was actually renovated by one of Scarpa's disciples, Giuseppe Tommasi, and was only opened in 2010. 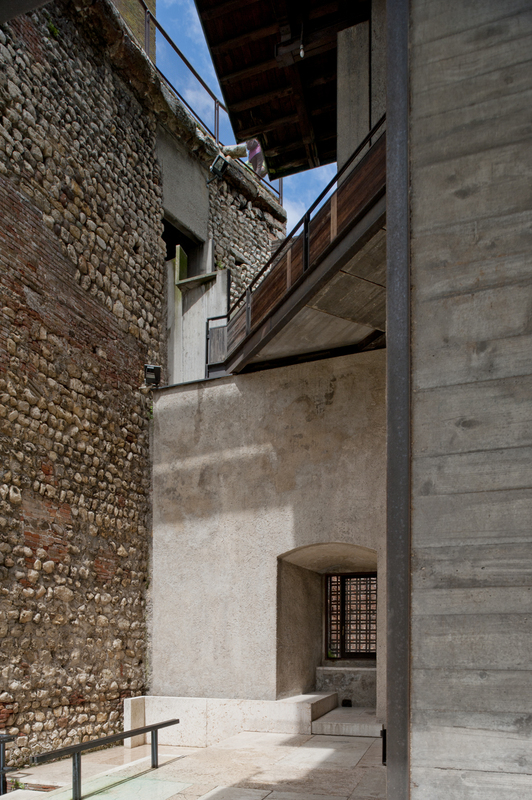 The floors are supported by exposed struts that can be seen from the courtyard. 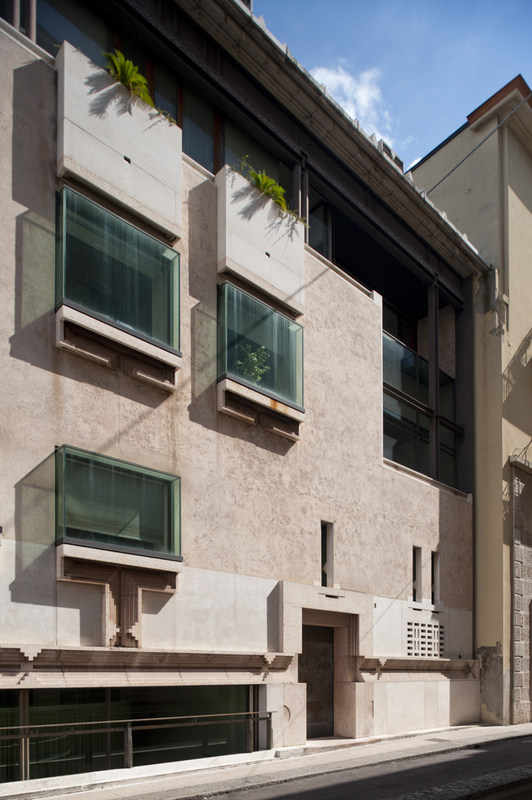 Separated from Scarpa's interventions by the walk along the ramparts, this is a pretty sympathetic, minimal-impact renovation. Tommasi also created a roof garden next to the clock tower. 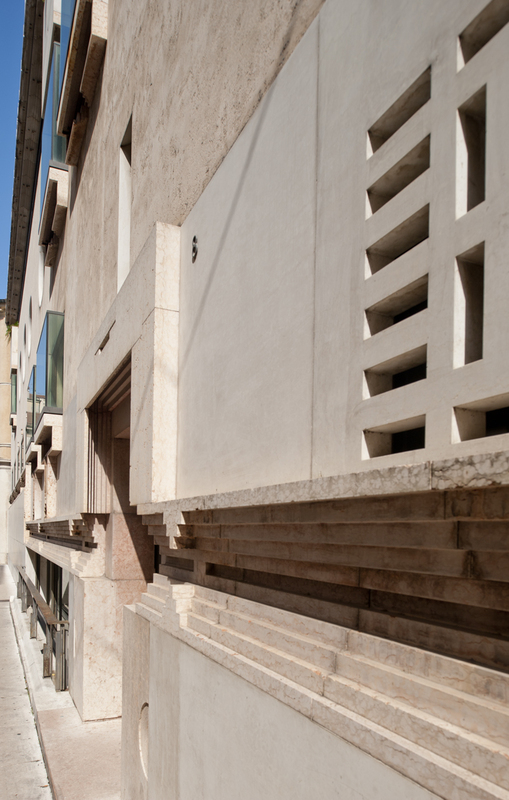 Scarpa created this walkway along the riverfront ramparts that gives views across the water, but also a close-up look at how the various layers of the building come together. 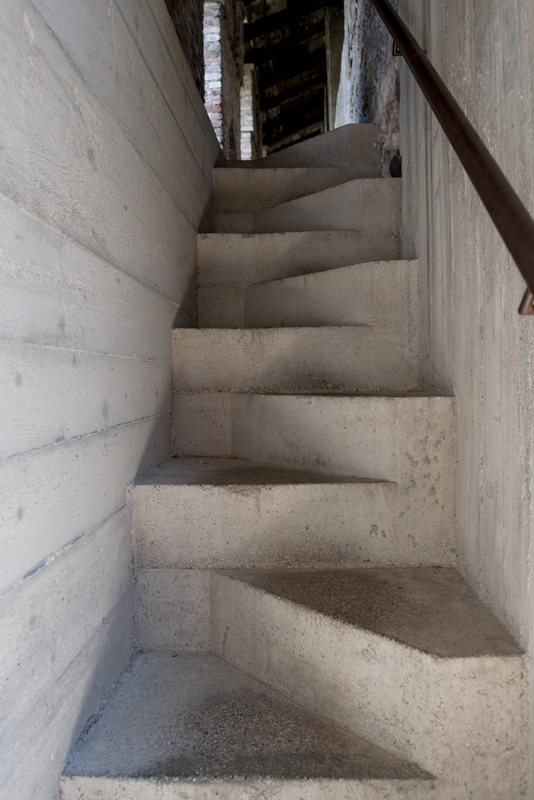 Scarpa delighted in creating stairs, most of which would never pass code in the US. 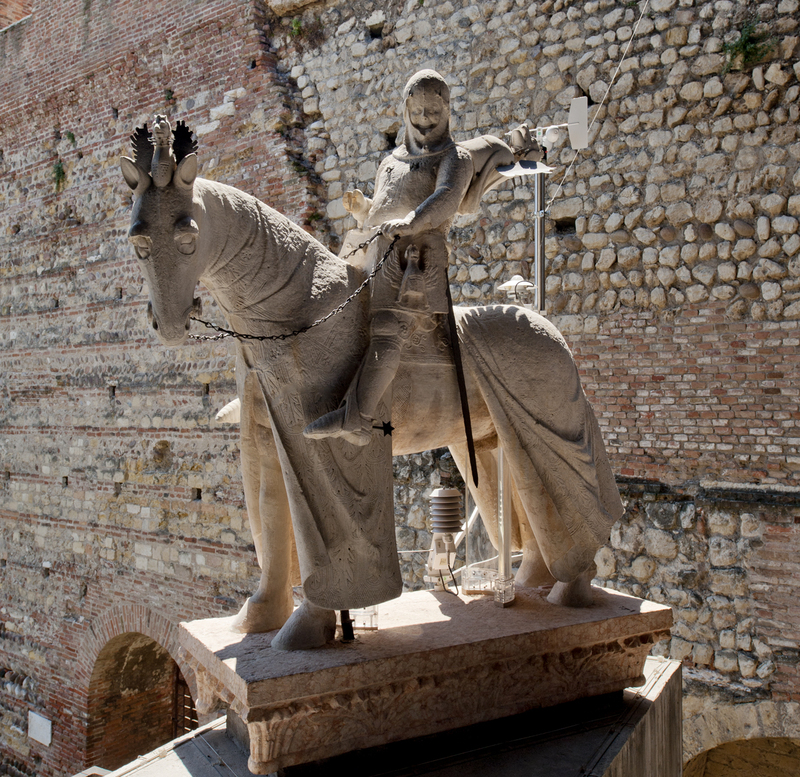 Cangrande's statue is meant to be approached from all angles. Here, a bridge over the area that I showed in some photographs above gives the first eye-level view. You may need to click on this image to enlarge it in order to see, but Cangrande has an enormous smile on his face. 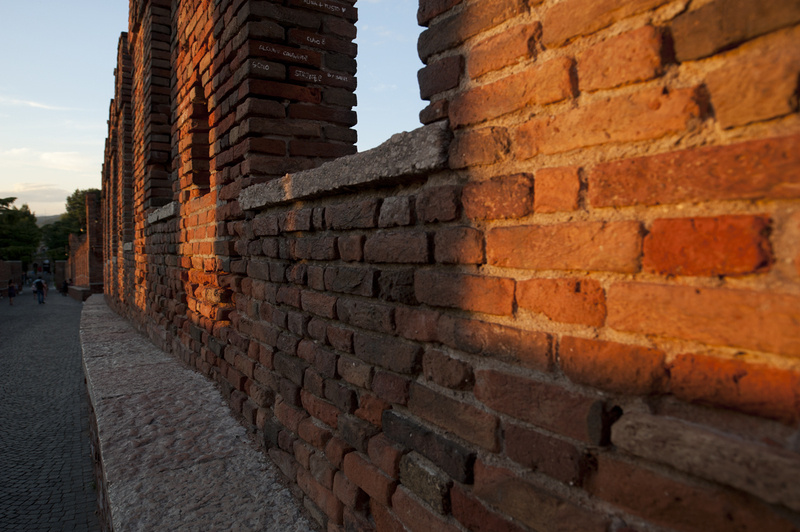 He was the ruler responsible for bringing Dante and other luminaries to Verona, and ushering in an era of prosperity. His son, Cangrande II, was responsible for building this castle, and is credited with none of the positive attributes of his father. 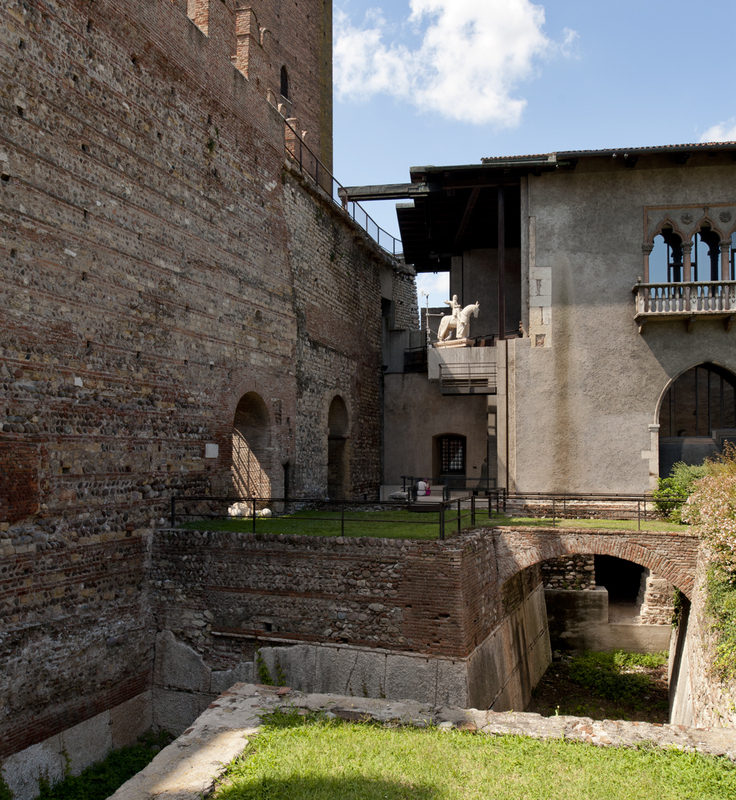 The castle was built for the ruthless ruler to keep out Veronese, not foreign invaders. 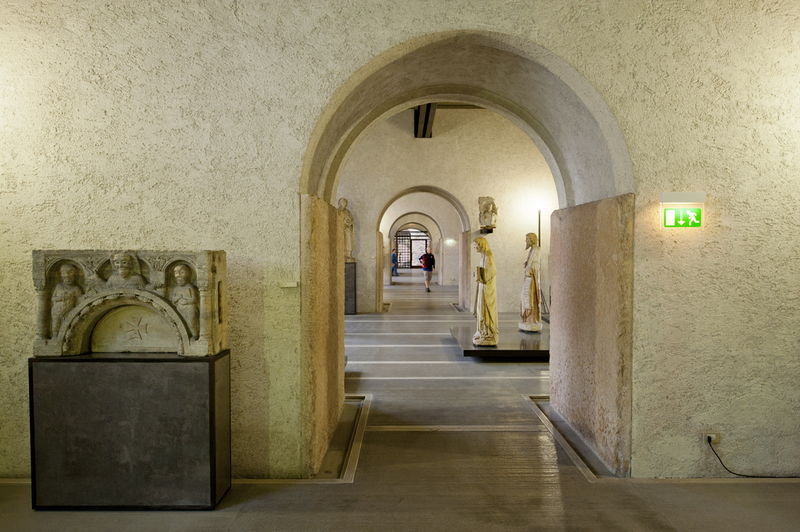 The painting wing features a narrowing corridor, which accentuates the perspectival effect. 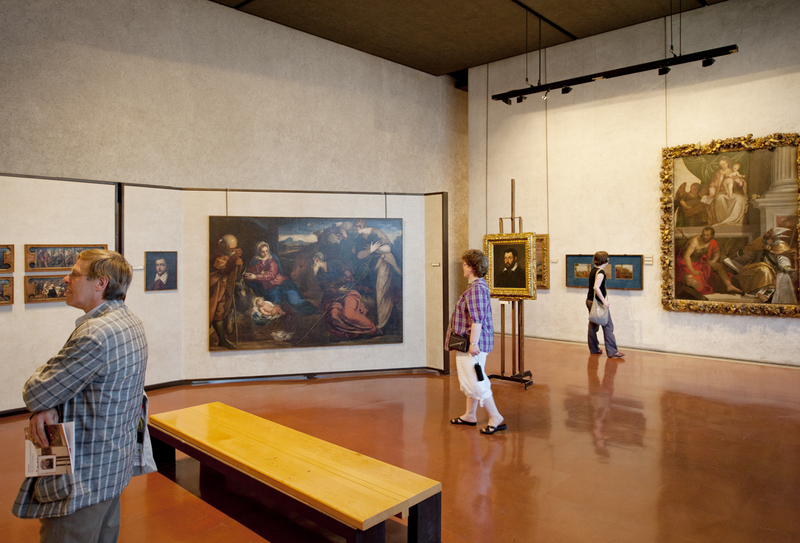 Again, the somewhat sparse surroundings and spare frames help visitors focus on the artwork (non-architects, at least). Here Girolamo Dai Libri's Modonna of the Parasol gets some star treatment. 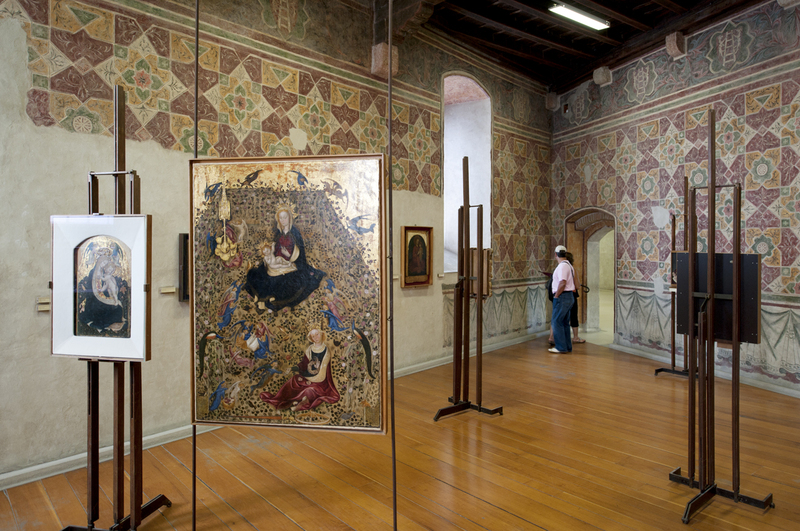 This section is devoted to Tintoretto and Veronese. It's a little shocking to see these displayed in a non-climate controlled environment, and I wonder how long it will be before air conditioning is introduced. The dark gray plaster ceiling is punctuated by wooden grills. Another view of the interior moat, and the bridge area with Cangrande's statue. 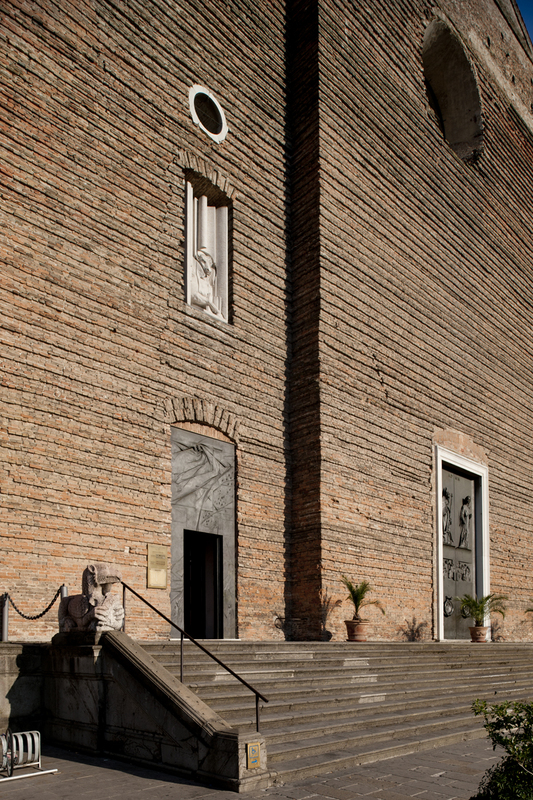 The Banca Popolare di Verona, designed by Scarpa later in life, is unfortunately almost impossible to enter. No amount of pleading convinced the bank officials to let me in, although a Spanish architect that I met at the Castelvecchio told me that he was able to get in for ten minutes after three days of begging. 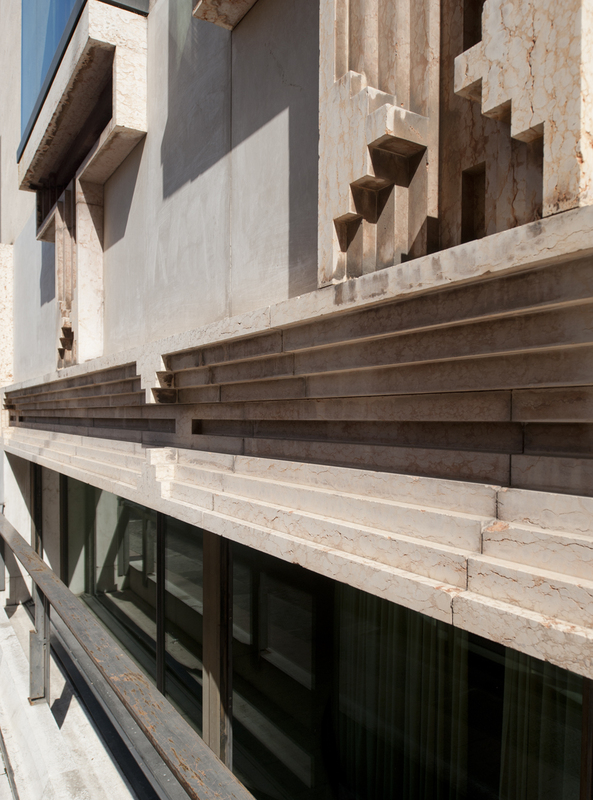 Although it's a bank, Scarpa did not hold back from his customary obsession with detail on this project. These stepped motifs show up a lot in Scarpa's later work, particularly at the Brion Cemetery. It was only after taking this photo that I realized the circular windows are different sizes. I have always wanted to get inside this building, and I'm pretty disappointed that I couldn't. I wonder how many architects' sob stories the guards have heard. 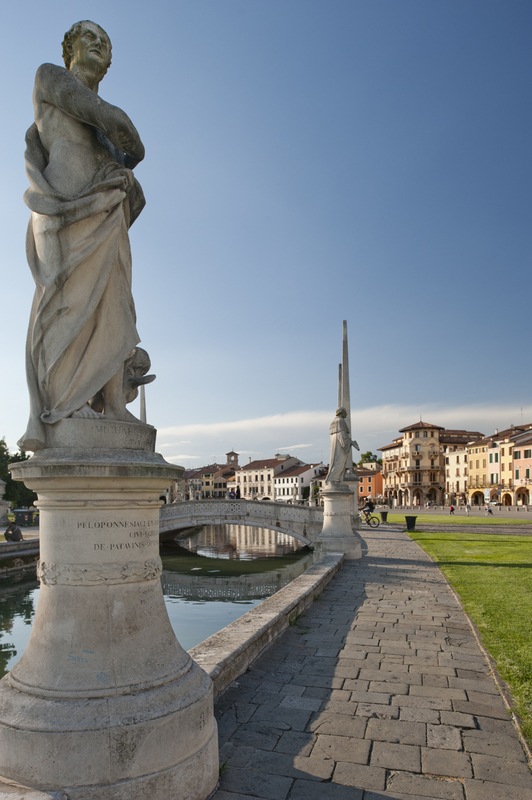 I’m finally back home, but I, of course, have a big post backlog, so I’ll start here, with a roundup of Padova, and an intro to Verona. 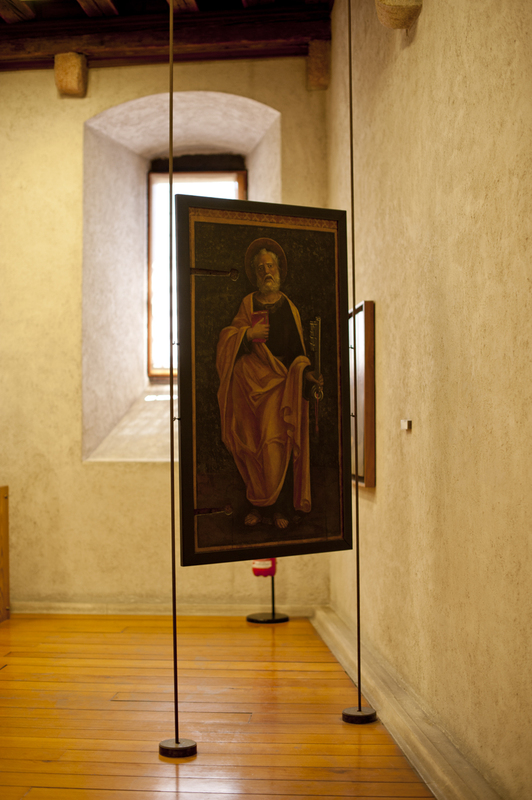 My trip to the Scrovegni Chapel was memorable, not just for Giotto’s frescoes, but also for the elaborate security and acclimatization procedures. 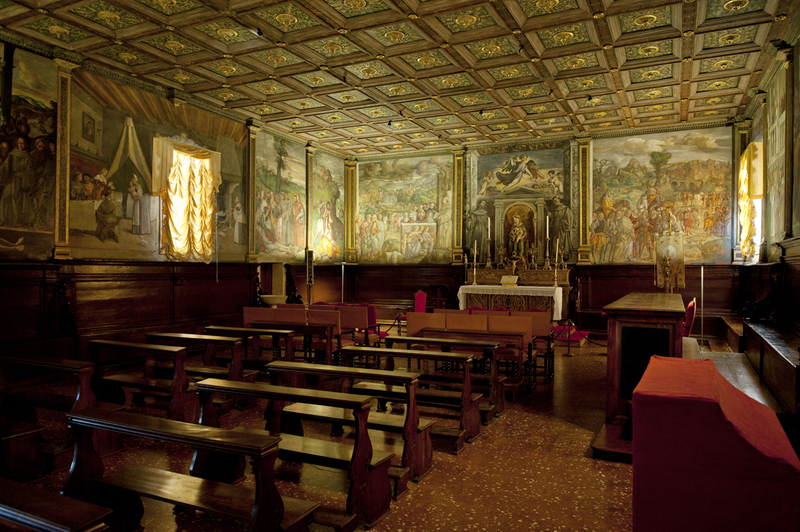 Before entering, we were brought into a sealed glass anteroom, in groups of twenty-five, to watch a fifteen minute video about the chapel, during which we were acclimated to the interior environment. 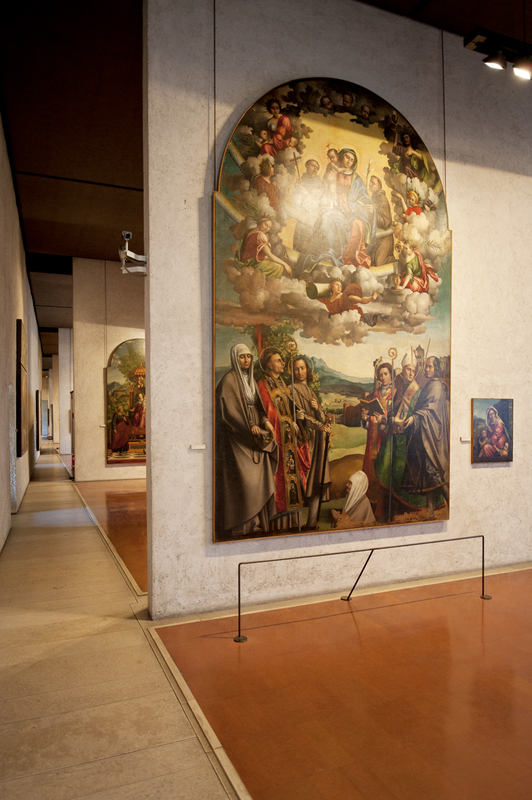 Once inside, it was fascinating to see the frescoes that I had only seen in photos in person. I was surprised at how large they seemed. I found Giotto’s depiction of hell to be the most exciting aspect of the chapel, which certainly seemed more exciting than heaven, which seemed really boring. Needless to say, photos were strictly prohibited. 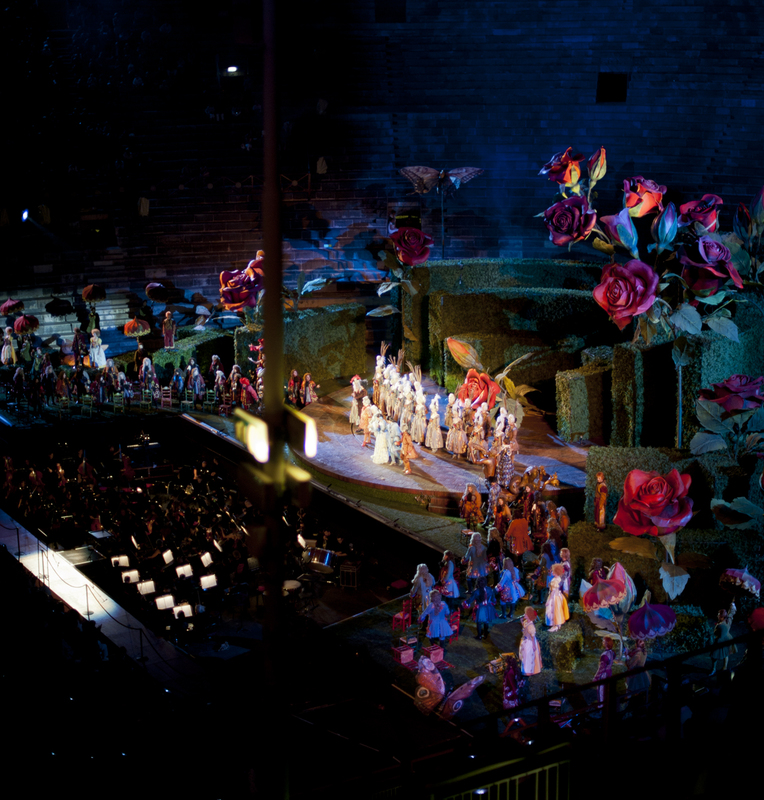 I’m also throwing in some images of the opera in Verona. 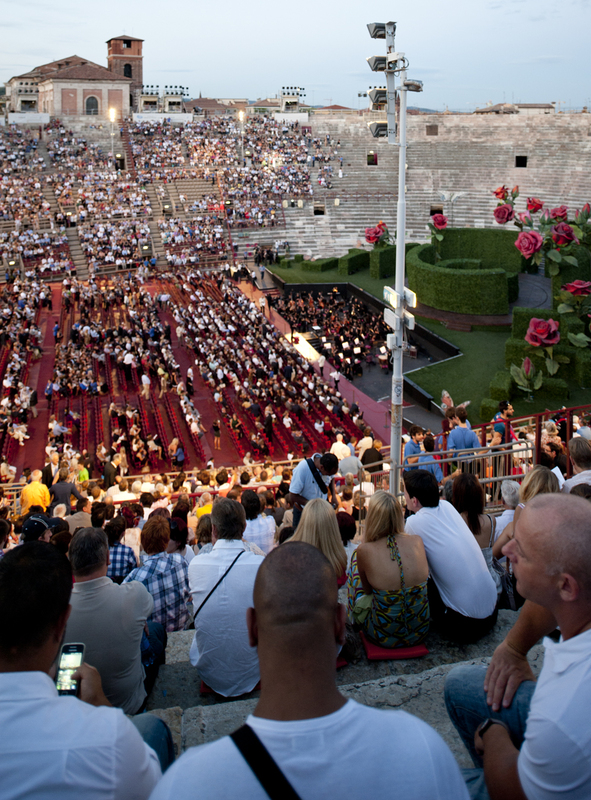 I had the pleasure of seeing Rossini’s Barber of Seville performed in the ancient arena. 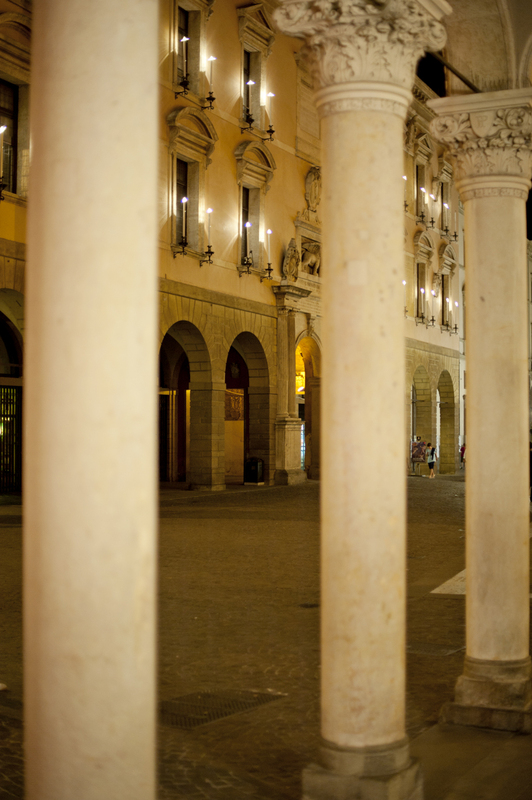 I arrived in Padova in the middle of doctoral dissertation defenses. Once candidates have successfully defended their dissertations, they are subjected to public ridicule by their friends and family in the form of mock defenses along the river. Usually, they are forced to dress in funny costumes, and take embarrassing questions from the audience. 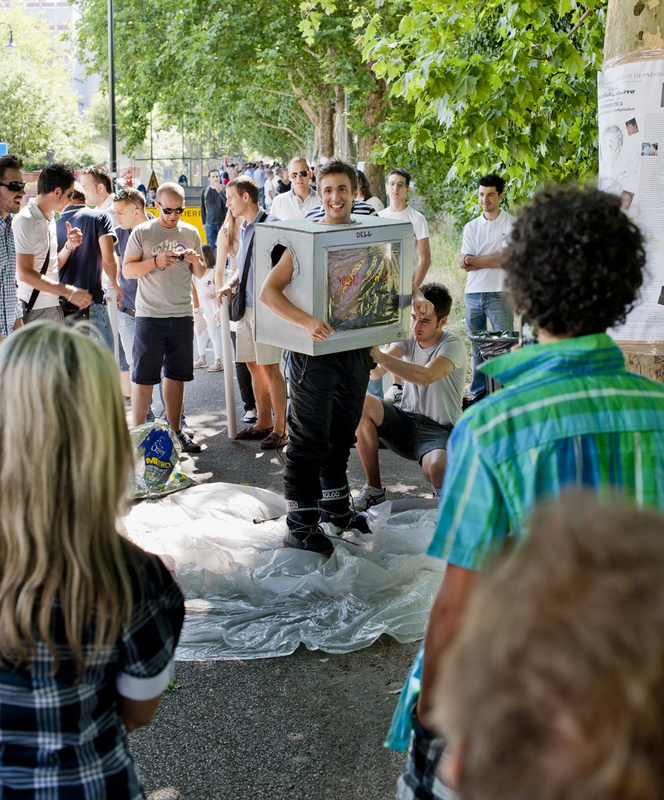 Frequently, the crowd breaks out in a song that goes something like this: "Dottore, Dottore! Something and a something, and a so-o-omething!" 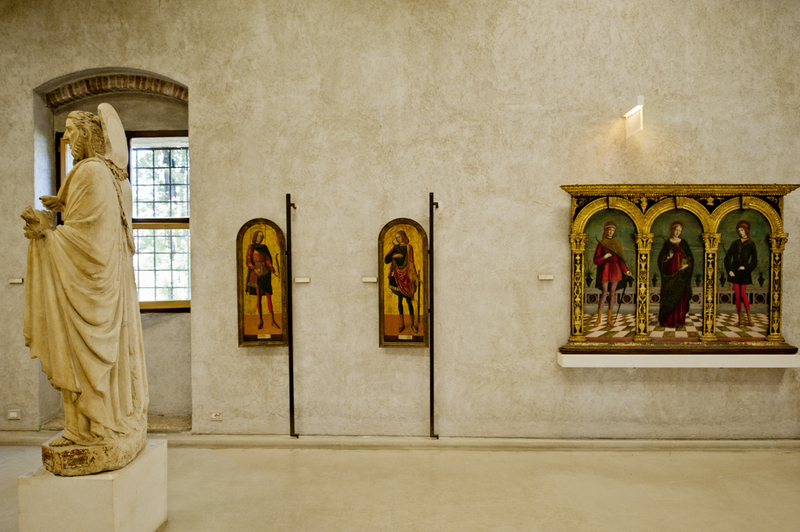 After visiting the Scrovegni Chapel, I took a walk next door to the Eremitanii Church, which featured some frescoes by Mantegna that were destroyed during World Ware II. Restorers have pieced them together tiny bit by tiny bit over the past fifty years, in what must be considered one of the world's most difficult jigsaw puzzles. 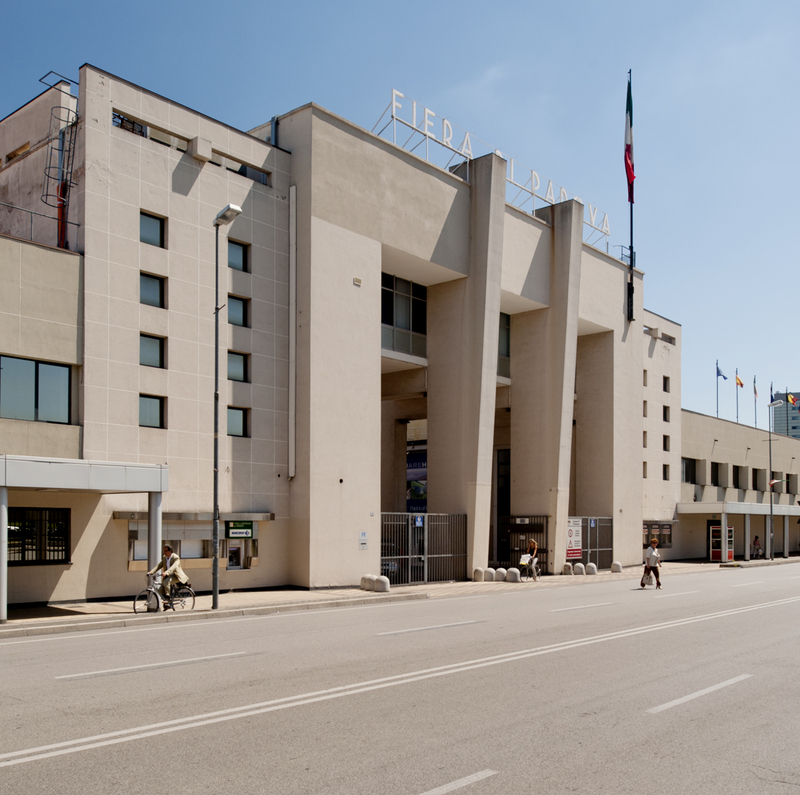 Padova still has its fair share of Mussolini-era architecture. 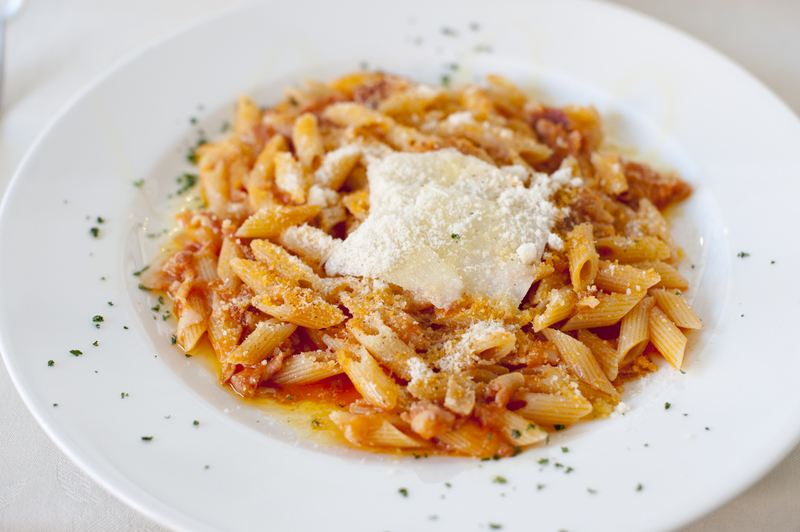 Pasta all'amatriciana (salty pork and other stuff in tomato sauce), with some nice shaved parmigiana reggiano. 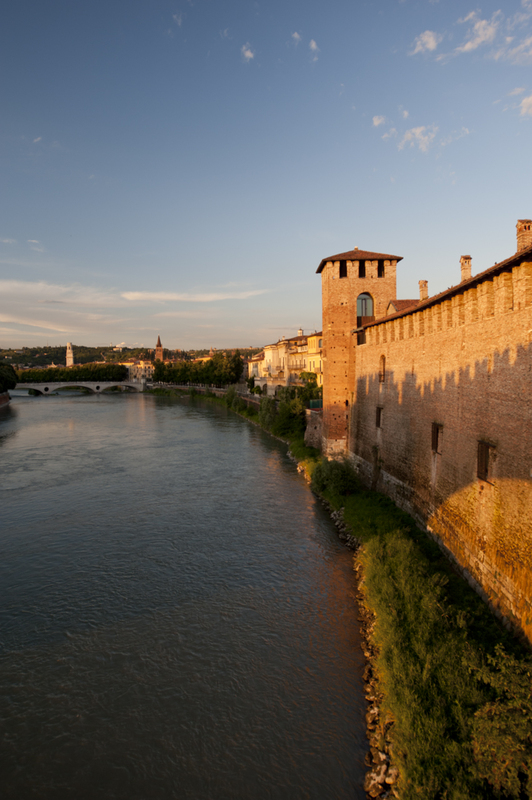 A view up the Adige River in Verona, with the Castelvecchio on the right. 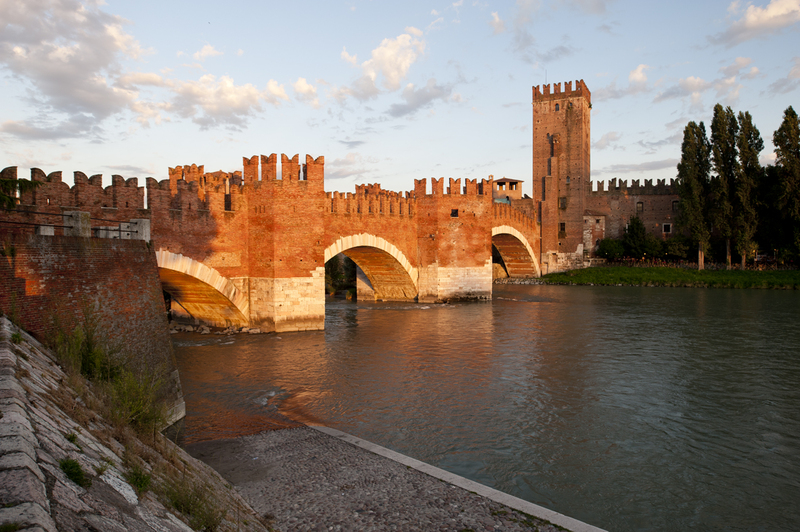 The Castelvecchio bridge was bombed by the Germans as they retreated, but was rebuilt shortly thereafter. The Castelvecchio, of which I'll have plenty of photos in the next post, glows in the evening. 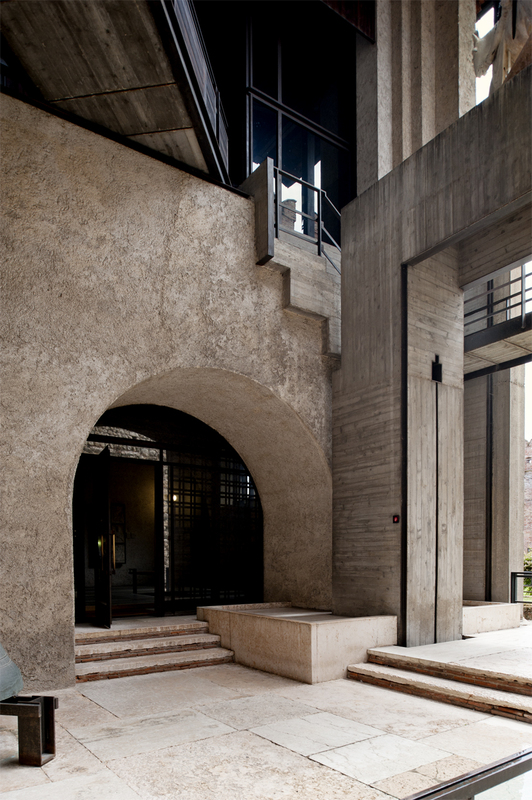 First built in 1354, Carlo Scarpa renovated it in the 1960s. 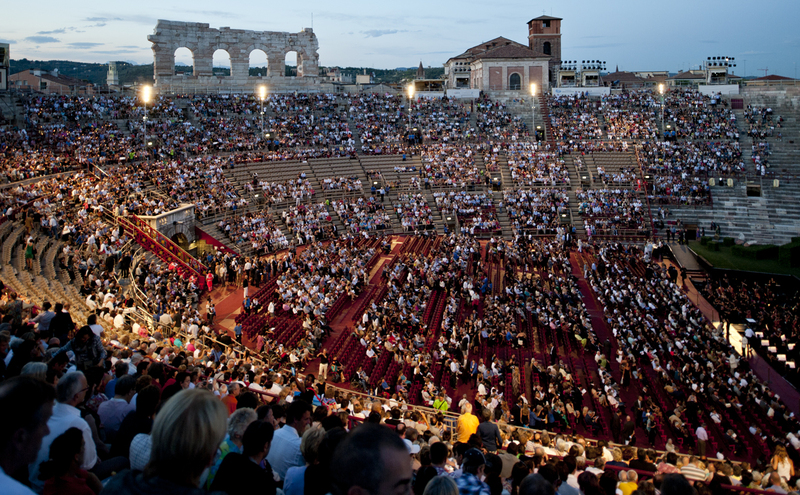 The arena, an old Roman colosseum, now hosts Verona's outdoor opera festival, and draws half a million people annually. Although I had a nosebleed seat, and a view obstructed by a pole that held an exit sign, it was still a pretty great experience to be there. Operas begin just after sunset, around 9:15, and the tradition is for the audience to light candles at the beginning of the performance. Neither I, nor anyone else in my section, was given one of these candles. 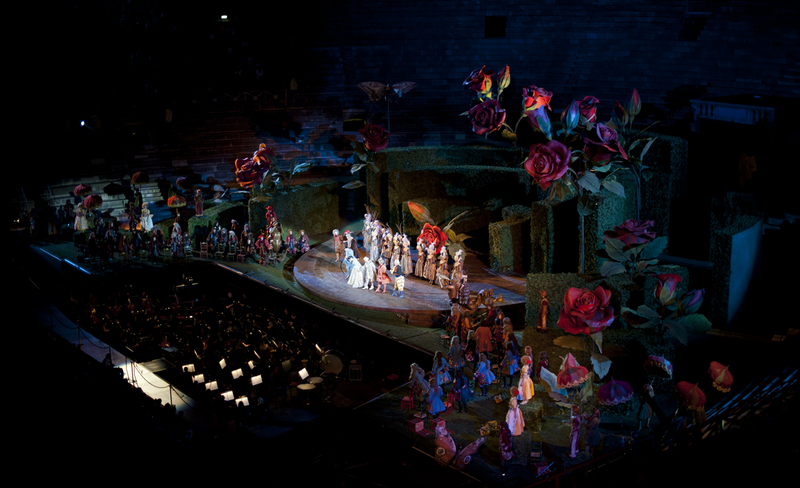 The opera, the Barber of Seville, by Rossini, was performed with no artificial amplification. Despite my cheap seat, I was surprisingly able to hear everything with ease. Most people would recognize the arias from any kind of exposure to TV advertisements or old cartoons. The opera didn't finish until around 12:30, and by that time, the marble ledge on which I was sitting had become more than a little uncomfortable. That did not prevent me from dozing off for a few minutes in the second act. Hello from Verona. I know that some of you have been patiently awaiting some post updates, but unfortunately, I won’t be able to give a full update just yet. I will attempt to relieve the post backlog over the next couple of days, and after I return to the states, on Wednesday. Since I was forced to post only a brief update from Padova yesterday, here’s the rest of the news from the Veneto. This is one of those places where I wish I could spend more time, not necessarily because I want to see more sites, but because I have enjoyed acclimating to the culture. 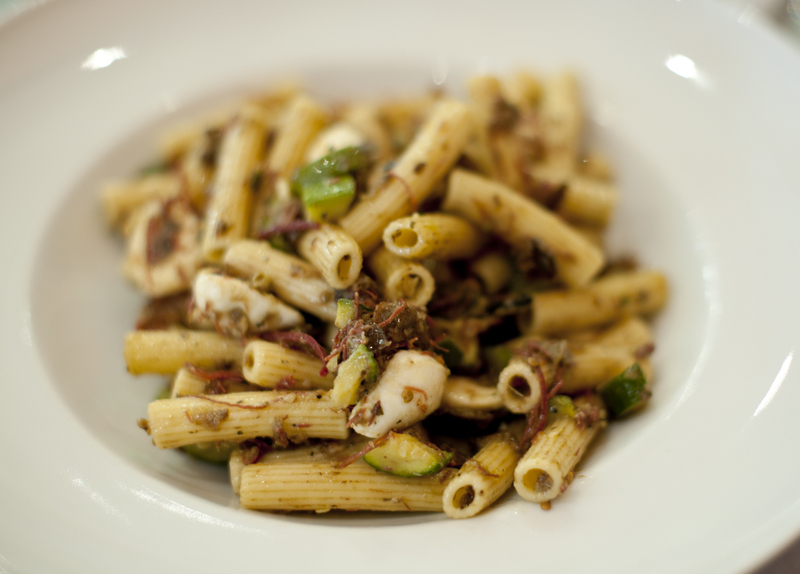 I'm moving away from Venetian seafood, and this pasta with meat (not sure which kind), olives, and mozzarella made a great lunch. 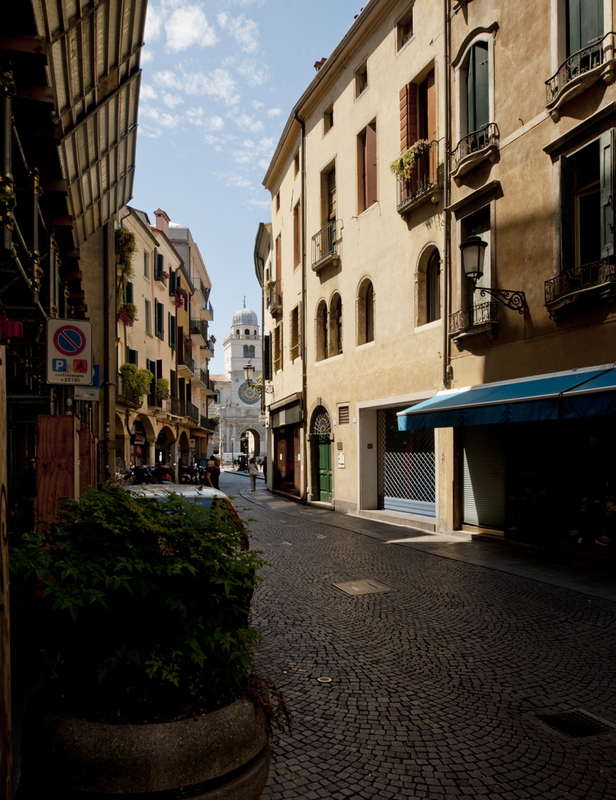 This is the Piazza delle Erbe, in the medieval center of the city. 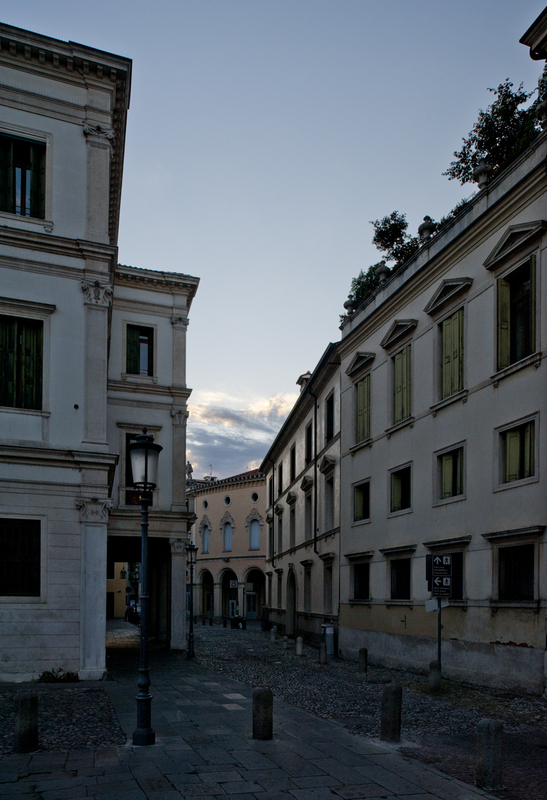 The building across he plaza is the Piazza della Ragione, which dates from 1218. 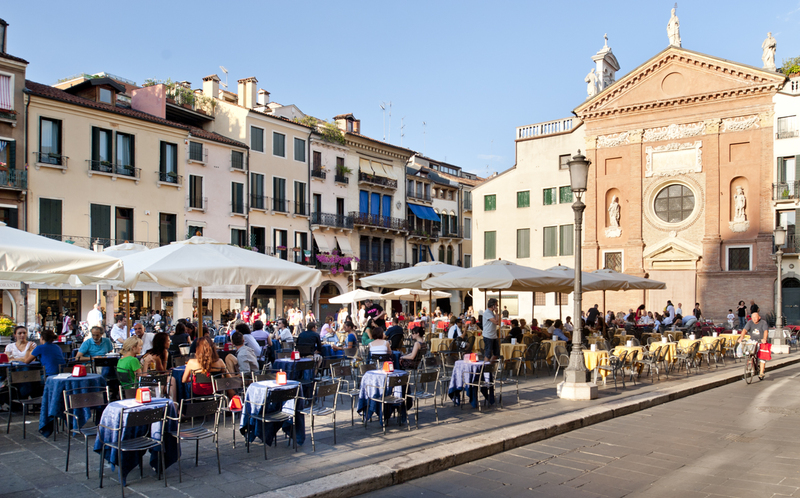 The winding narrow streets open up onto small piazzas that are filled with cafe tables. There seem to be equal quantities of bicycles and cars in this town. 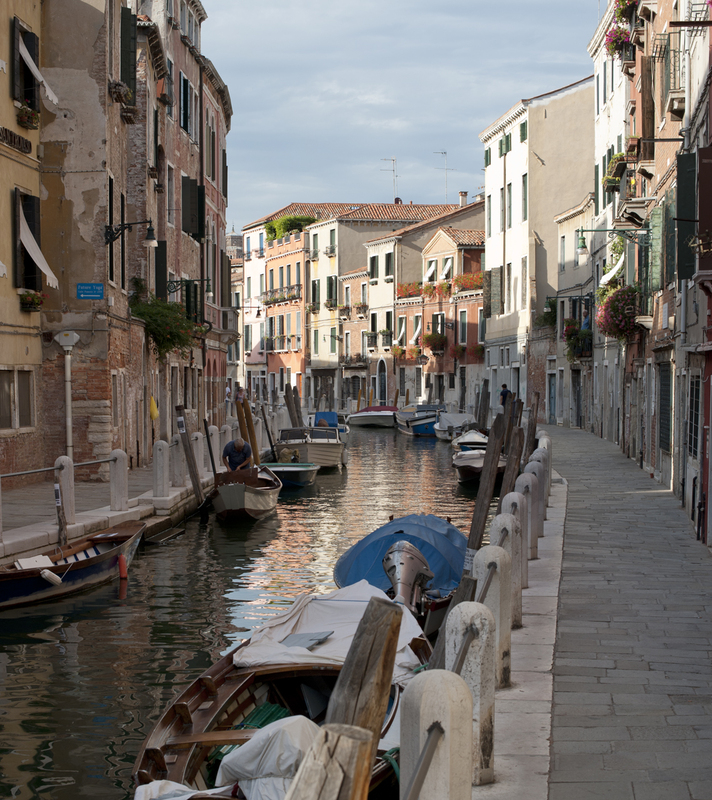 After being in Venice, i was a little out of practice in sharing the road with them. 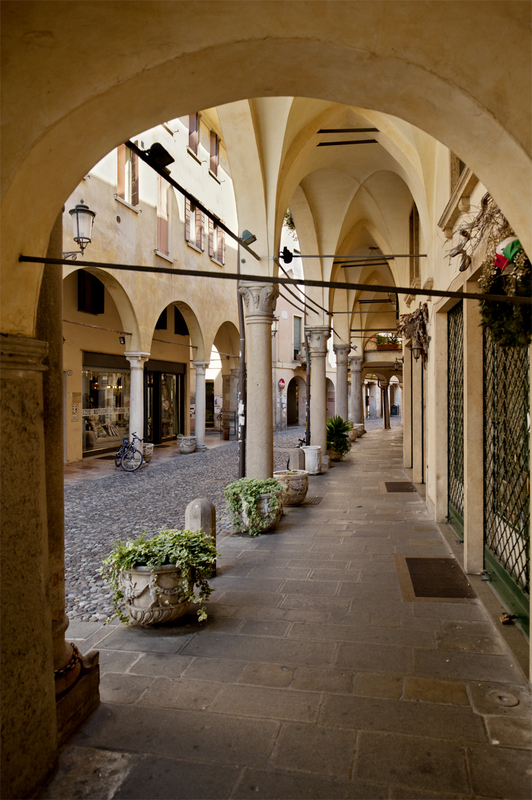 Padova has an endless series of arcaded streets, which provide a cool breeze on a hot day, and shelter in the rain. 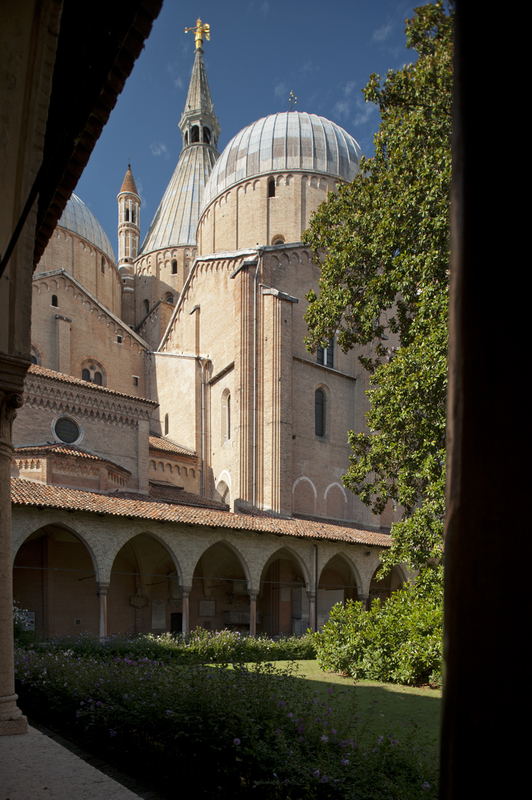 The Basilica di Sant' Antonio is surrounded by some peaceful cloisters, and the monastery here is still active. 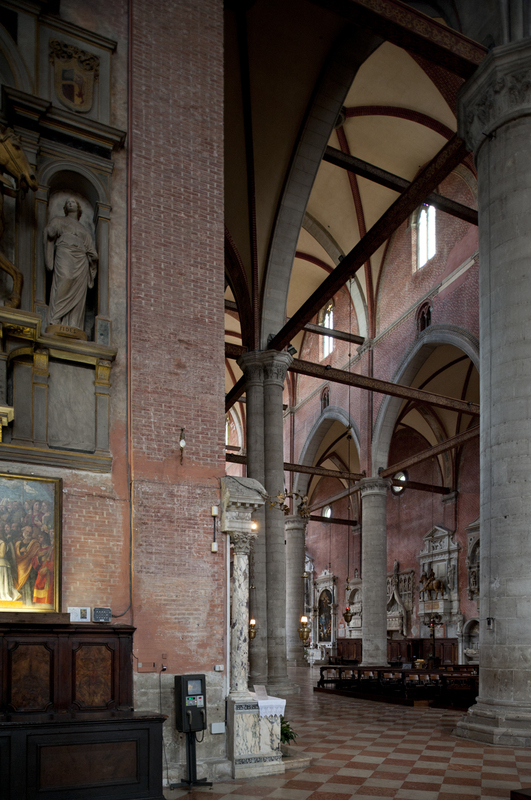 Sant' Antonio houses a bunch of relics of Padova's patron saint, Saint Anthony. Among other body parts on display, his tongue is preserved in a glass and gold jar. I would not have known that it was a tongue if I hadn't been told, because it looked nothing like flesh. Photography is strictly prohibited within, but I must say that after seeing Hagia Sophia, which was built in 537, the church, built around 1200 could not help but seem dark and a bit stifling. It's amazing that I'm still more and more impressed with Hagia Sophia, and I'm now nowhere near it. 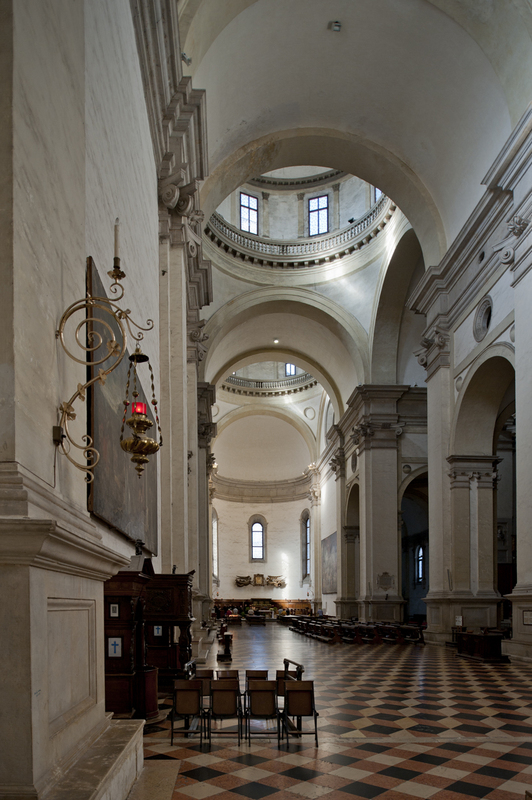 Next to Sant' Antonio, the Scoletta del Santo (pictured here) contains a number of early Titians, and the neighboring Oratorio di San Giorgio is covered in frescoes by Altichiero da Zevio and Jacopo Avanzi. 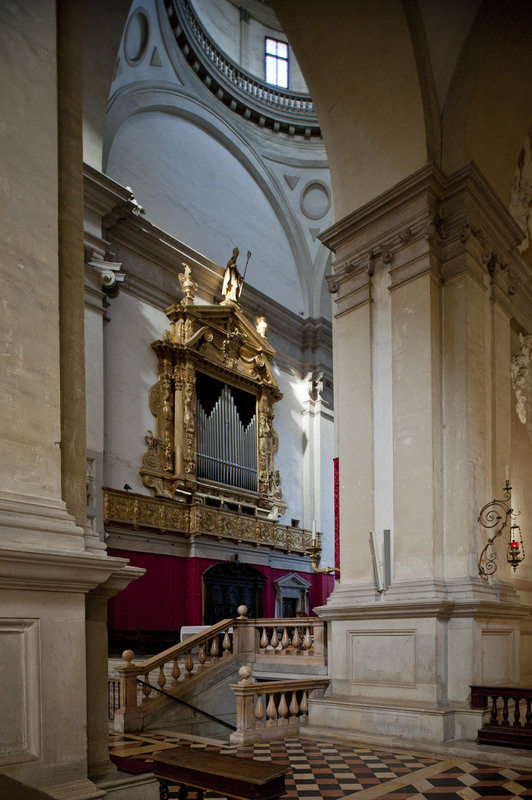 For some reason, these are not at all popular with tourists, and while I was joined by the sleepy guard at the Oratorio, he let me into the Scoletta all by myself (which is why you see a photo of it). I was thoroughly impressed by the Oratorio, and after later seeing Giotto's frescoes, it was interesting to see how much painting had changed in sixty years. 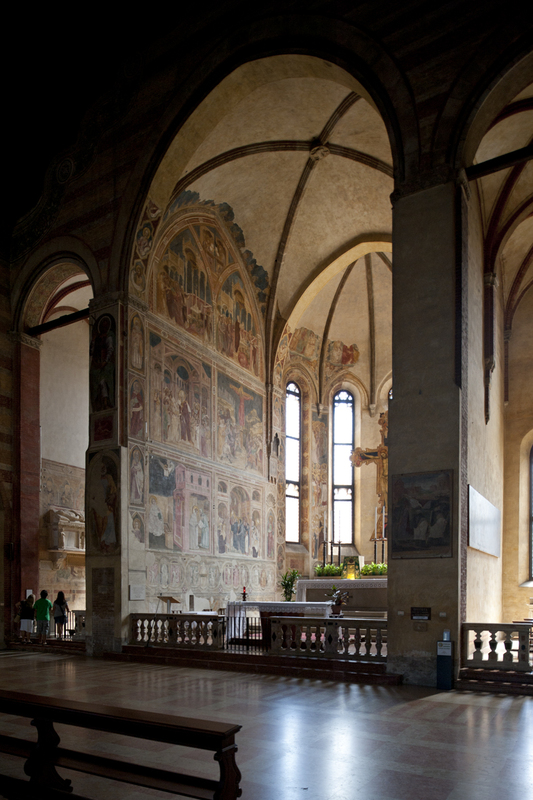 The frescoes depict the lives of Saints George and Lucy, and it was fascinating to look at them as precursors to comic books. I was particularly taken with Saint Lucy's story, and her face was recognizable in each frame. In one panel, which reads from left to right, she appears three times in the same scene, escaping death twice, and succumbing to a ruffian's knife. 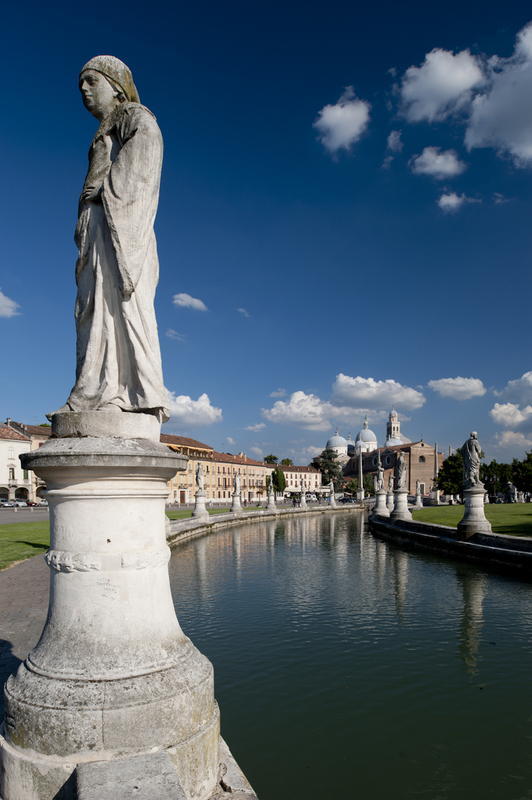 The eliptical Prato della Valle is lined by 78 statues of Padovans from history. In the distance, the Basilica di Santa Giustina can be seen. 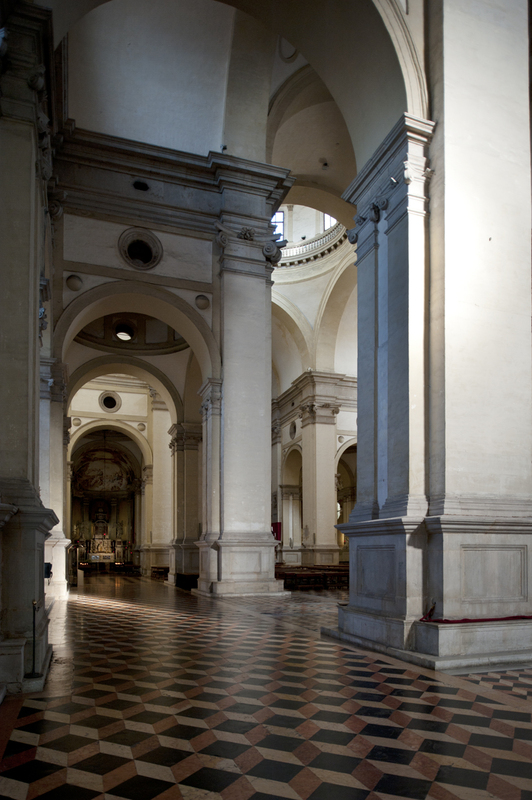 Another site that tourists seem to disregard, the Basilica di Santa Giustina is a huge, quiet church with spare ornamentation, and a painting of Santa Giustina by Veronese. The apse contains the most ornamental portions of the church, and gold provides the dominant color. 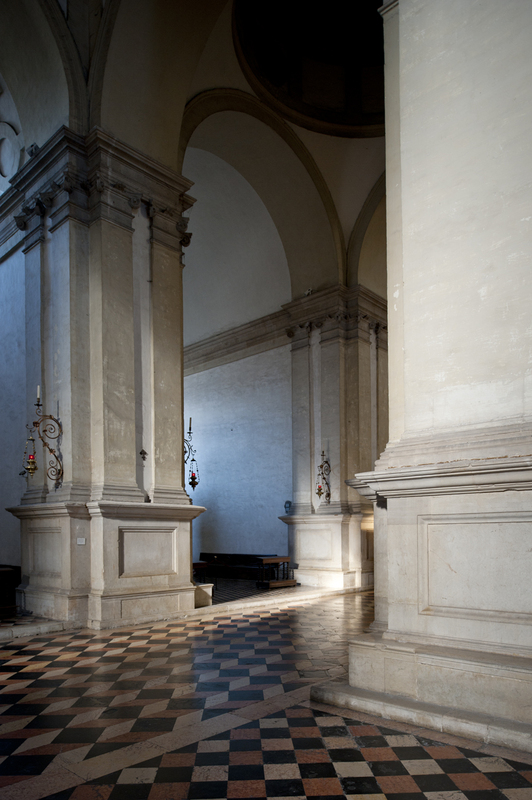 In the distance of this picture, which was taken across the transept, a small service was taking place. The monks were singing the mass in the most mellow, delicate fashion, which made every other mass that I have heard seem like heavy metal compared to Chet Baker. The music definitely contributed to my appreciation of the church, and like witnessing a service in one of Istanbul's mosques, it was great to hear the church filled with its intended sounds. 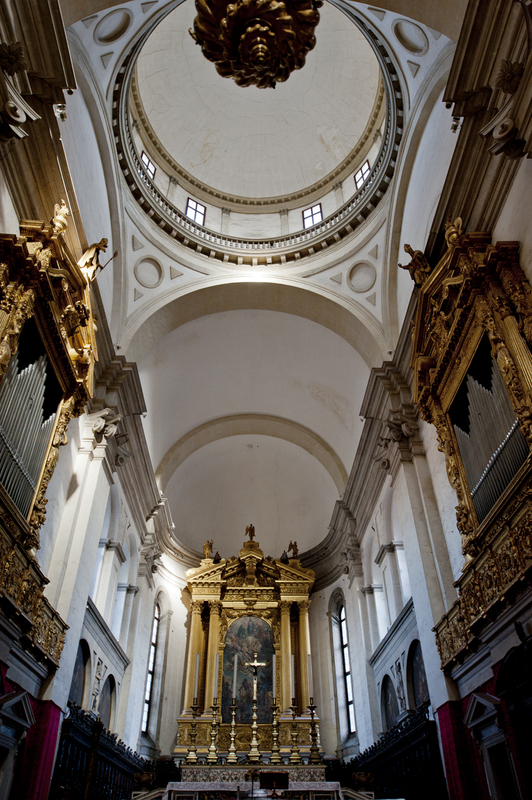 After seeing countless churches coated in frescoes and intricate carvings, this place was refreshingly simple. 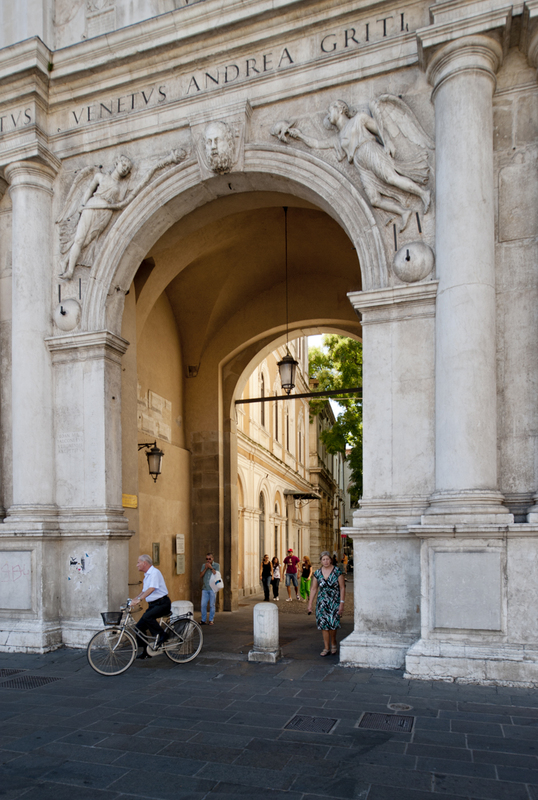 From what I could tell, the doors to the basilica, in addition to the relief above the left door, were added recently to the 16th Century facade. 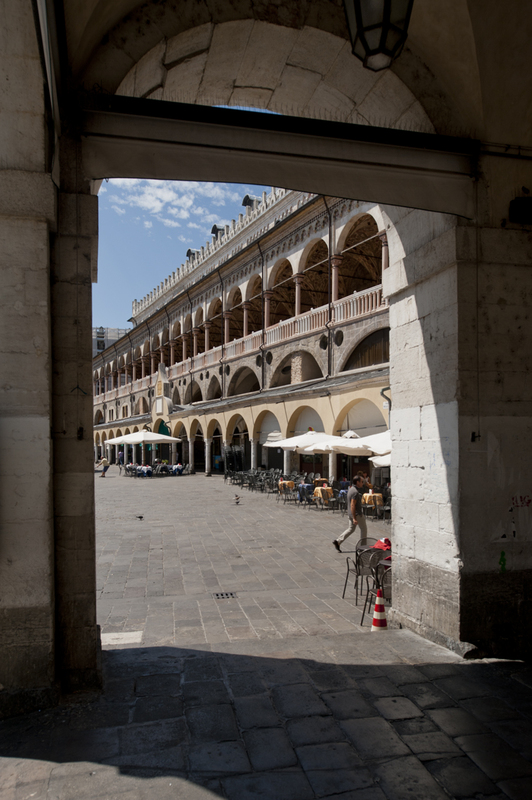 The Prato seems like an incongruently grand space for a town like this. 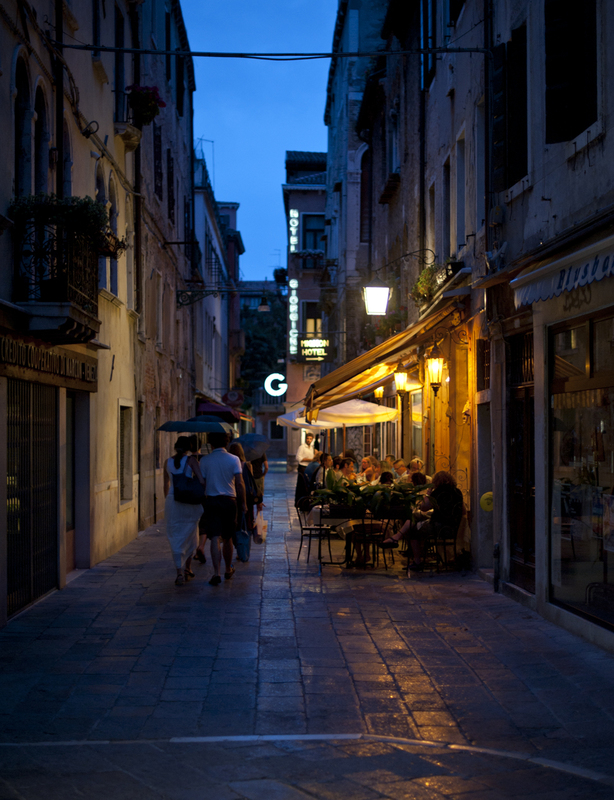 Towards evening, Padovans make their way to one of the countless outdoor cafes for aperativi. Not a bad place to enjoy a spritz. The roads in the older part of town are composed of round river stones, which makes them somewhat uncomfortable for walking. Fortunately, smooth marble paths surround them. 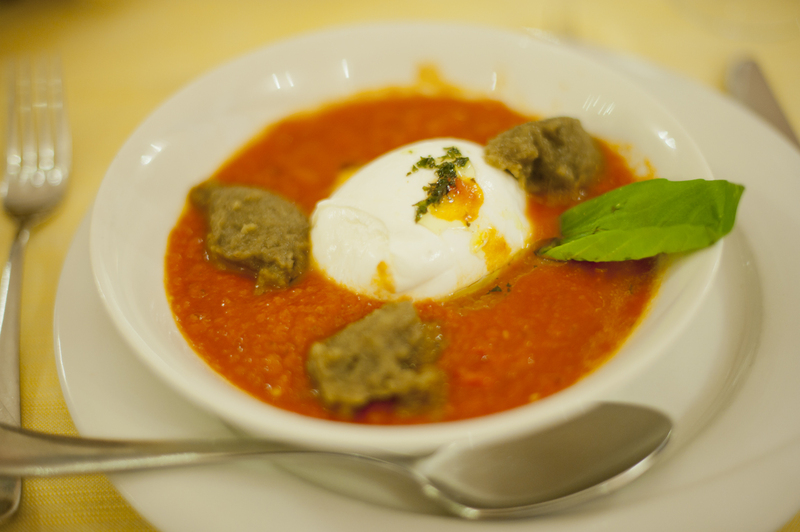 My waitress recommended that I try this dish, mozzarella di bufala, tomato sauce, and pureed eggplant. 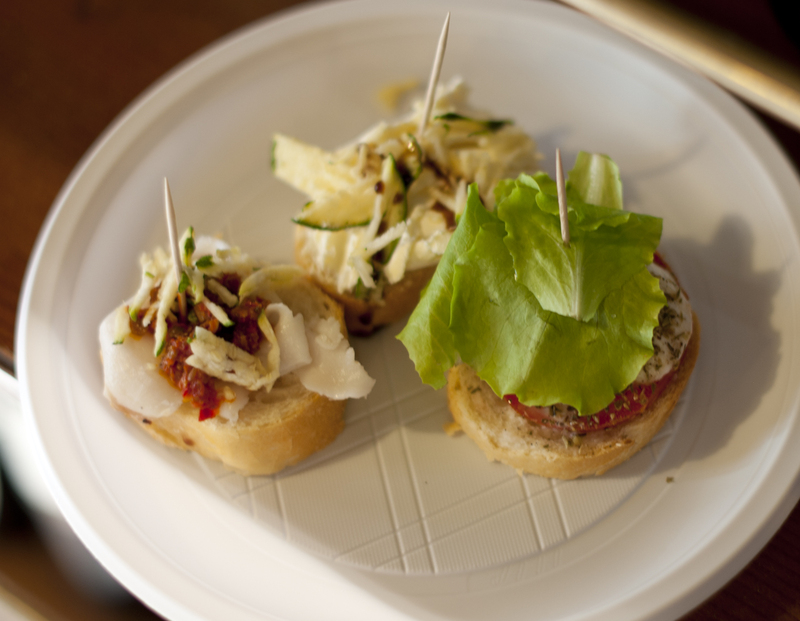 I had been looking forward to having some bufala mozzarella for a long time, and this did not disappoint. 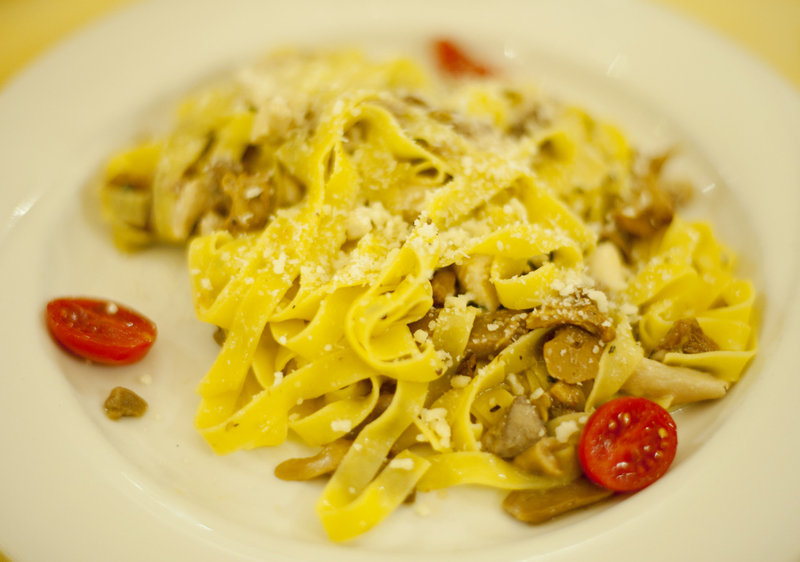 For dinner, my waitress suggested this, tagliatelle with rabit and mushrooms. 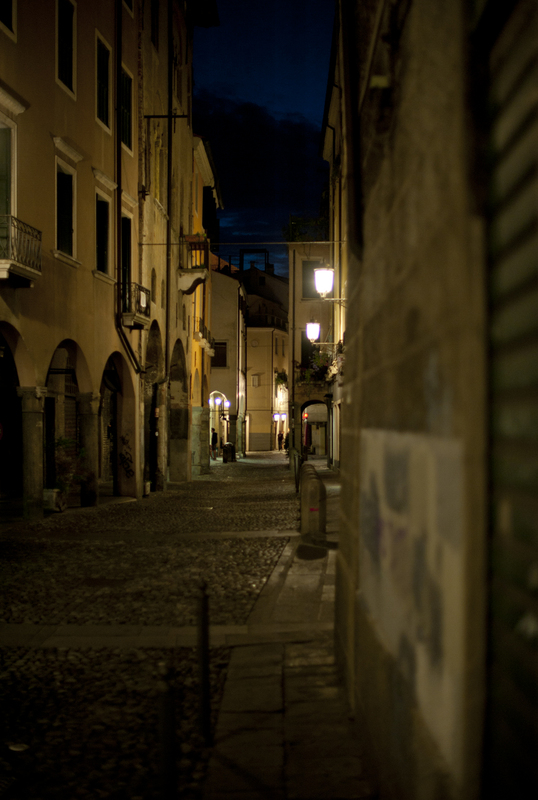 Padova's little streets get silent at night. A beacon for late diners. 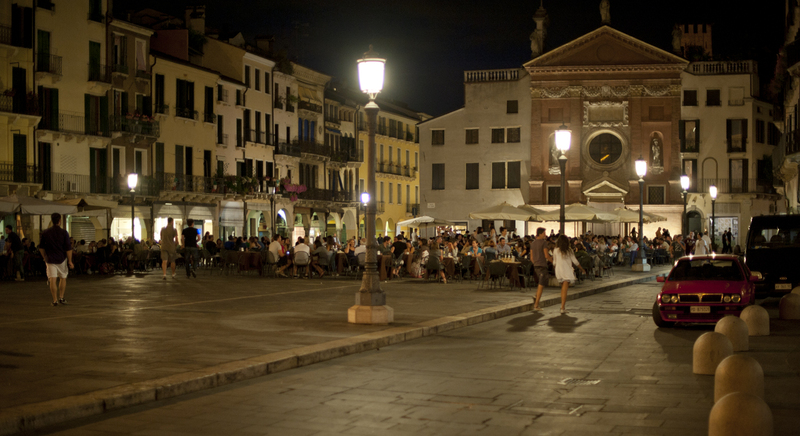 Although the streets go quiet, the piazzas come to life, and people stay at these outdoor cafes well into the night. 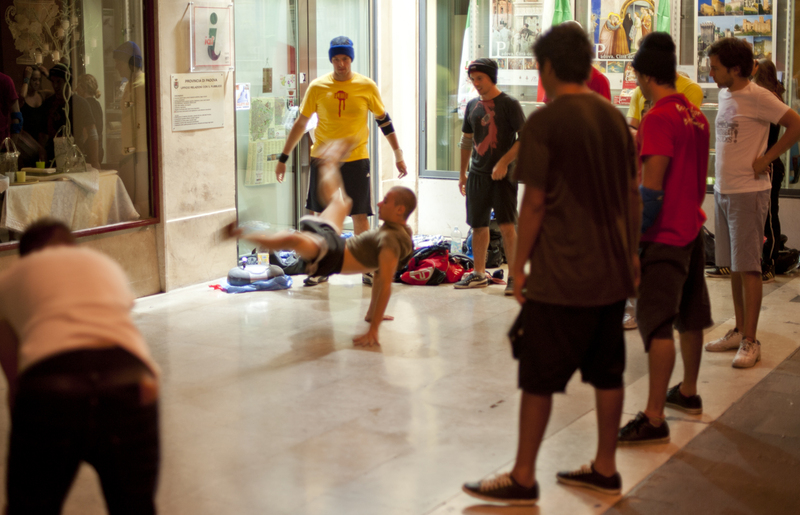 I turned a corner to find these kids practicing their breakdancing. Within earshot from the dance party, a view from the eighteenth century. 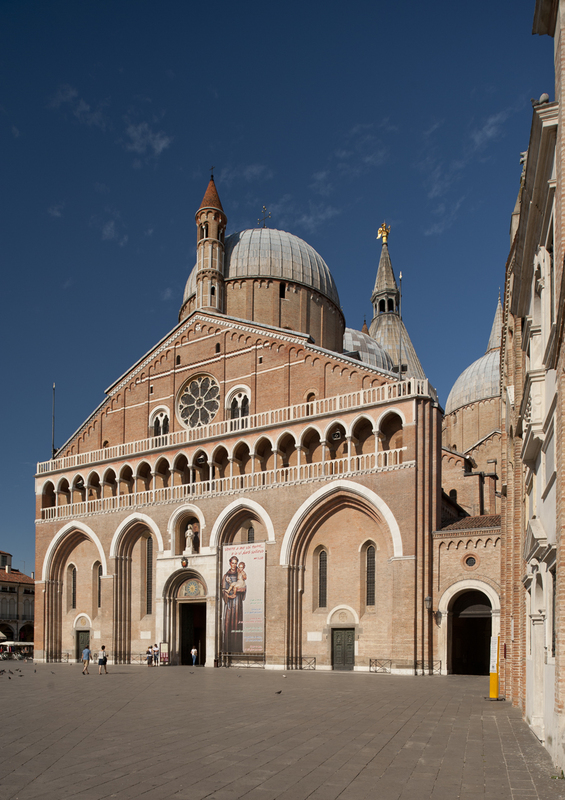 I set off from Venice this morning to the pilgrimage/university town of Padova, home of Saint Anthony’s assorted body parts. Some of you may be wondering why I am continuing to travel after I’ve already reached Venice, the destination in the title of this blog. The answer is fourfold: a) I’m interested in Venice’s context among its neighbors and rivals, and the resultant transitions, b) Padova was technically part of the city-state of Venice for centuries, c) Venice was prohibitively expensive after four days, and d) flights out of Milan are half the price as those out of Venice, so why not visit some places along the way. 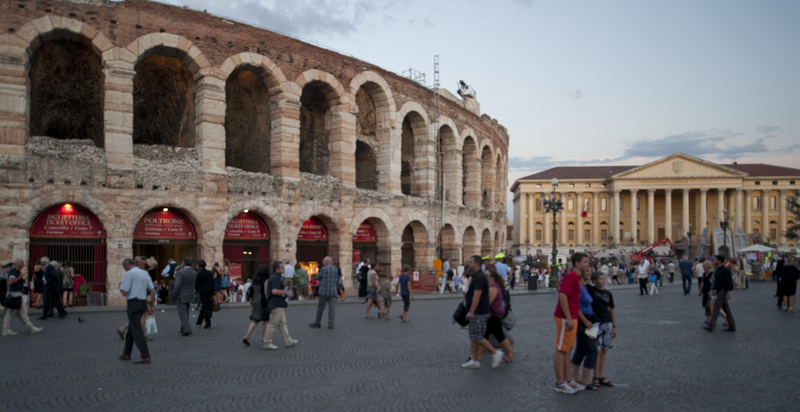 My next stop is Verona, where, in addition to paying some more respects to Scarpa, I’ll be attending an opera in an old Roman coliseum. 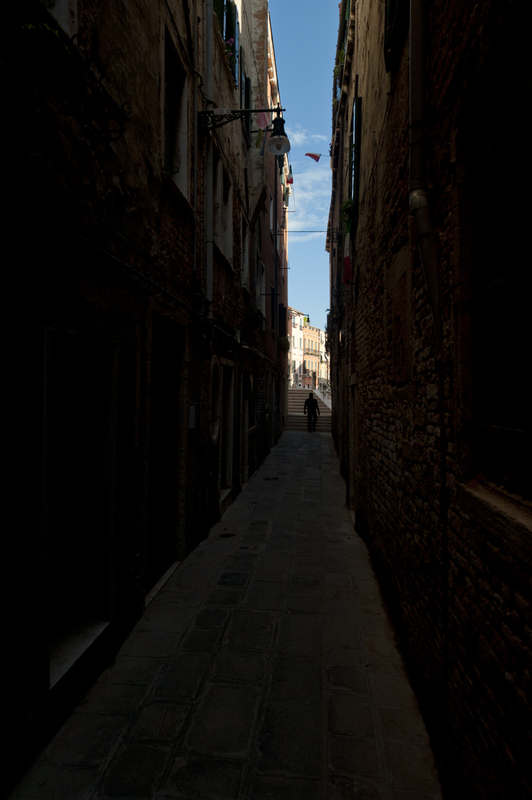 I must say, however, that I had a hard time leaving Venice this morning, which was really only made possible by the fact that I couldn’t bear another day in the hotel where I was staying (this mosquito-infested dungeon ranked somewhere between awful and hell). Unfortunately, I only have very limited access to internet tonight, so I need to quickly post only a couple of images. I’ll hopefully have more as soon as I can find a reliable internet connection, preferably tomorrow. 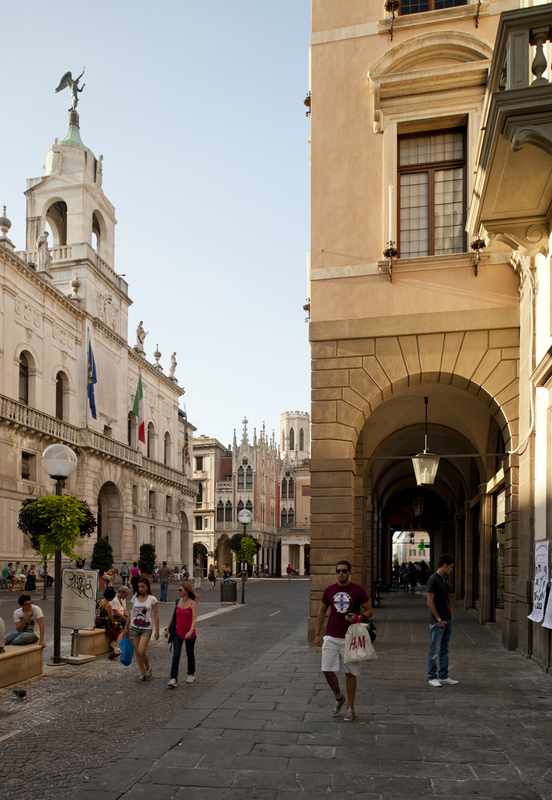 Padova is great, and it’s a town from which, despite it’s relatively small size, I would have a hard time leaving if I stayed a whole year, and a couple of days will be pretty tough. Tomorrow, I have a morning appointment at the Scrovegni Chapel (often called the Arena Chapel), and I’m looking forward to seeing Giotto’s frescoes in person after years of interacting with them in books. Unfortunately, for now, this is all that I have time to write. 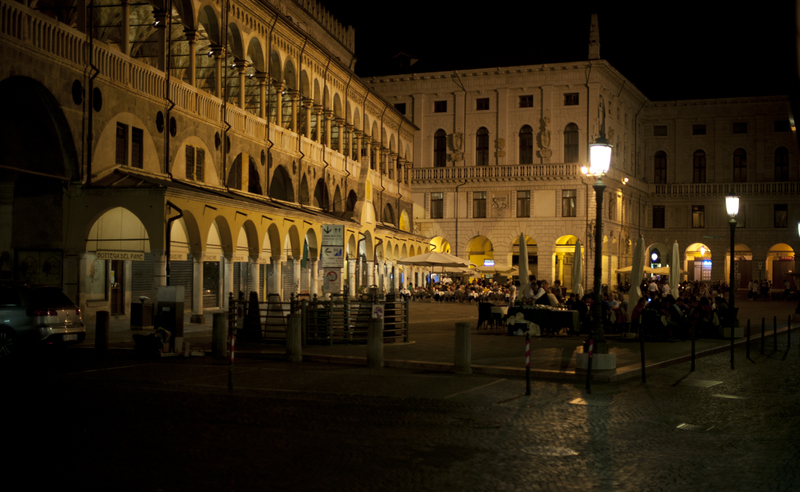 Padova is one of the livelier small towns that I've visited, especially at night. 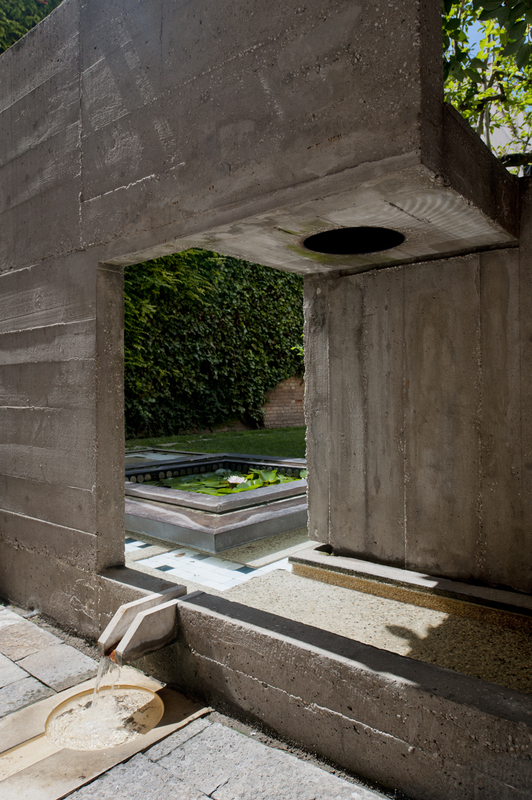 Today was my last day in Venice, and I spent most of it visiting some of Carlo Scarpa’s work around the city. 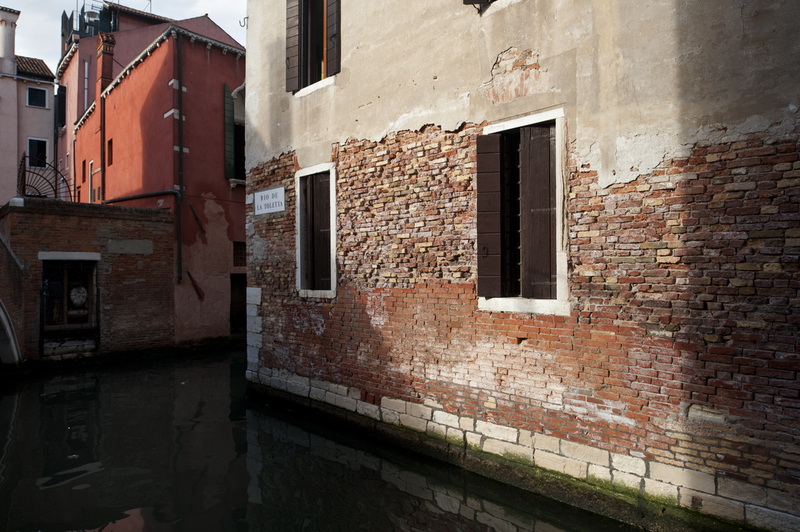 Scarpa, who was a Venetian native, left a number of projects in the area, including a number of small works at the Biennale, which I saw yesterday. 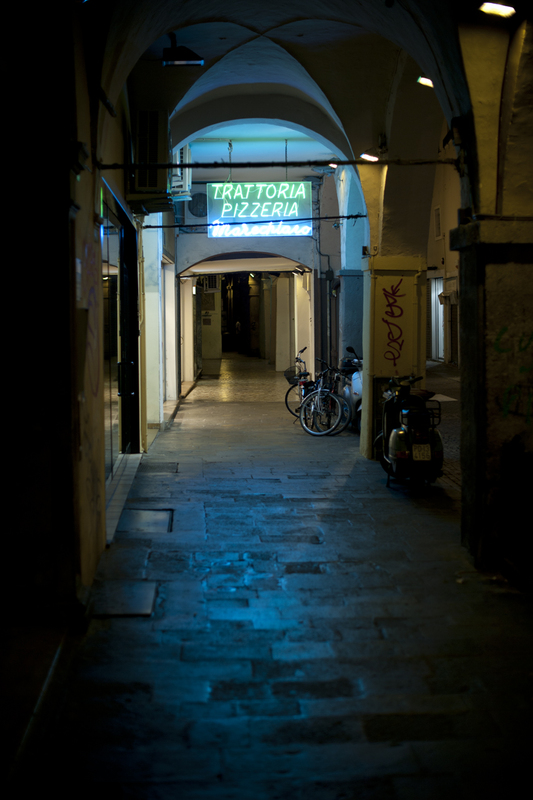 I also waited in line to get into San Marco for the first time, and, as usual, had some memorable meals. 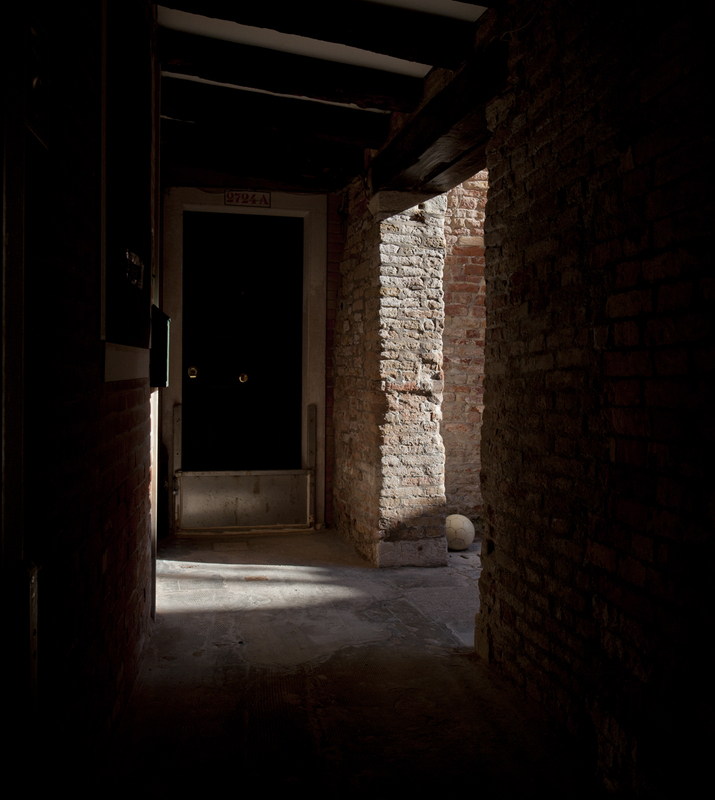 I’m packing up, and heading for Padua tomorrow, and I’m sorry to leave Venice. I’m also getting a little tired of moving, but I’m looking forward to the last week of my trip. I awoke to a glorious morning, with no trace of last night's rain. Rambling towards the Palazzo Querini Stampalia, in Campo Santa Maria di Formosa, I stopped off at this church, Zanipolo, on my way. 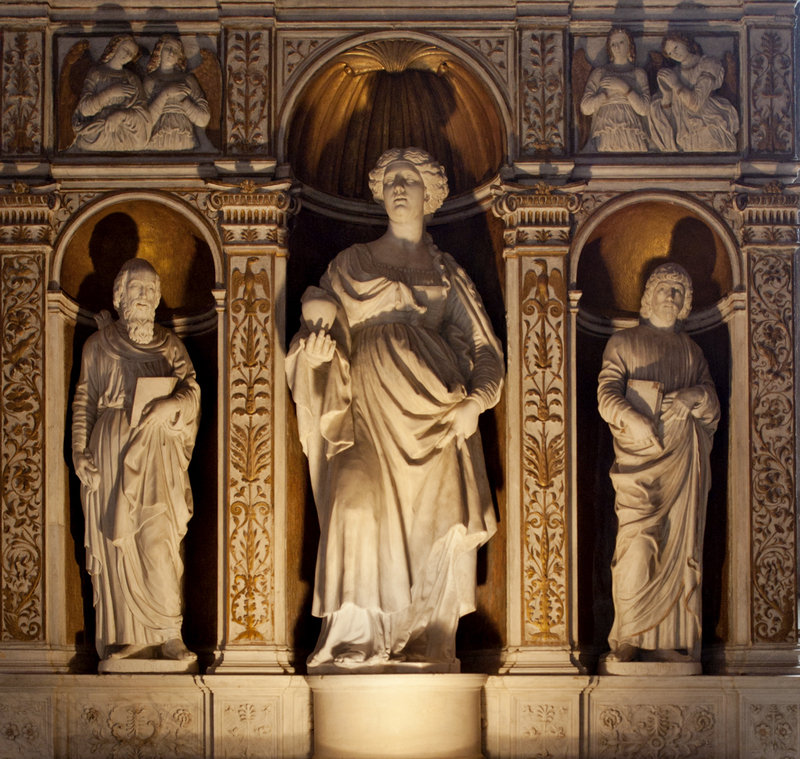 These statues are lit as though they are intended to strike fear in the hearts of would-be sinners. The Palazzo Querini Stampalia, was originally a palace belonging to a wealthy family, but it now houses a library/museum. 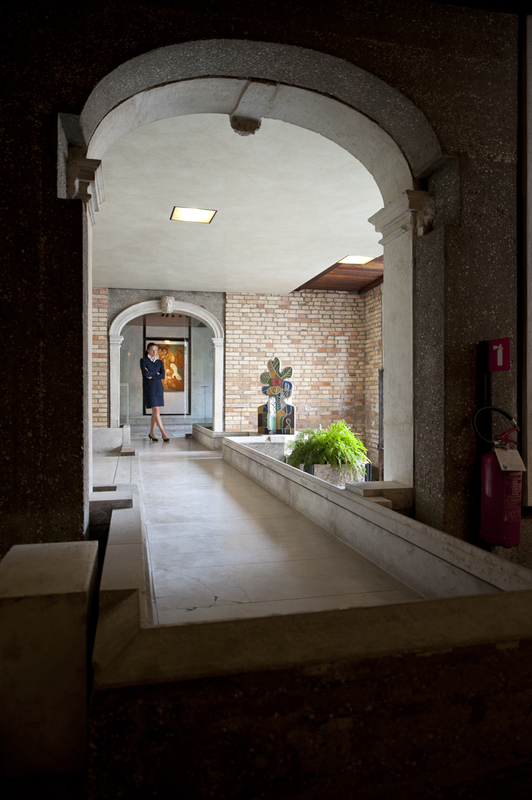 Carlo Scarpa renovated the 16th century palace's ground floor, and garden. He also built a new entrance bridge in the 1960s. 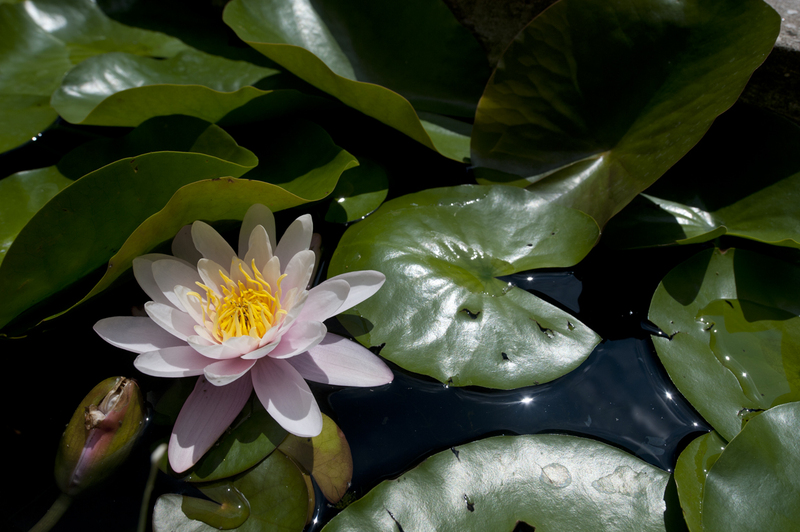 Water and lily gardens always seem to play important roles in Scarpa's outdoor spaces, and this is no exception. Water flows from one end of the garden to the other. 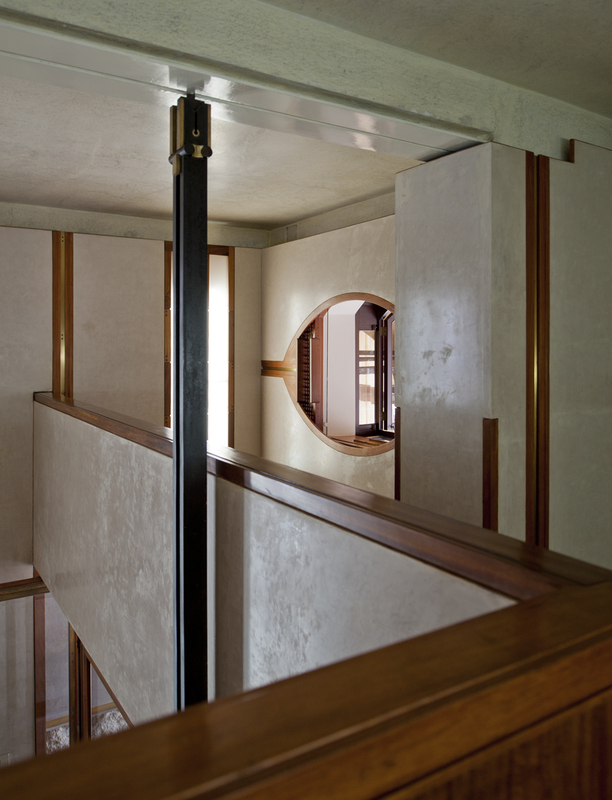 Scarpa's interior allows water from the neighboring canal to enter the building. 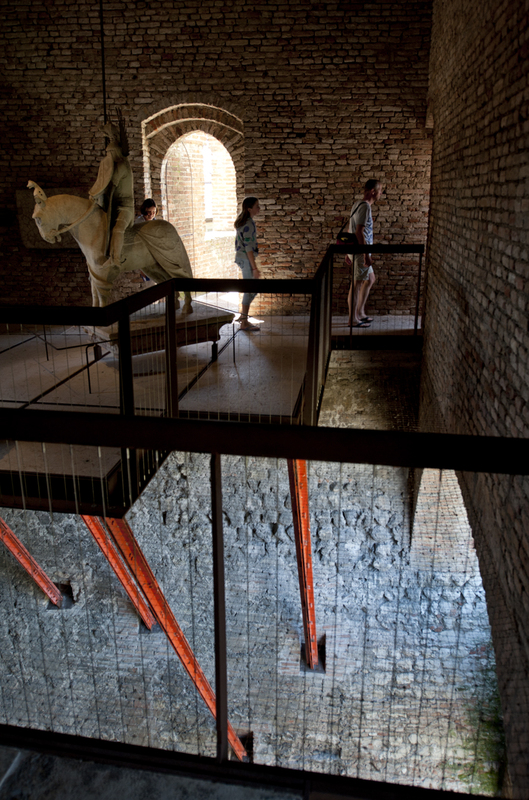 At high tide, a siphon system drains water into this neighboring room, which trickles in a series of paths created for it until it covers those. Unfortunately, I was there for low tide, and wasn't able to watch the process. By the way, photography is not allowed inside, but one thing that I've learned on this trip is that by pouring on a little charm, and offering a big warm smile, most rules can be broken. I was able to sweet-talk the guard pictured in the background here, although, for some reason, she was insistent on staying in the frame (I didn't object because it was certainly nice to have a scale figure). I've gotten in the habit of soliciting my waiter's opinions for every meal. 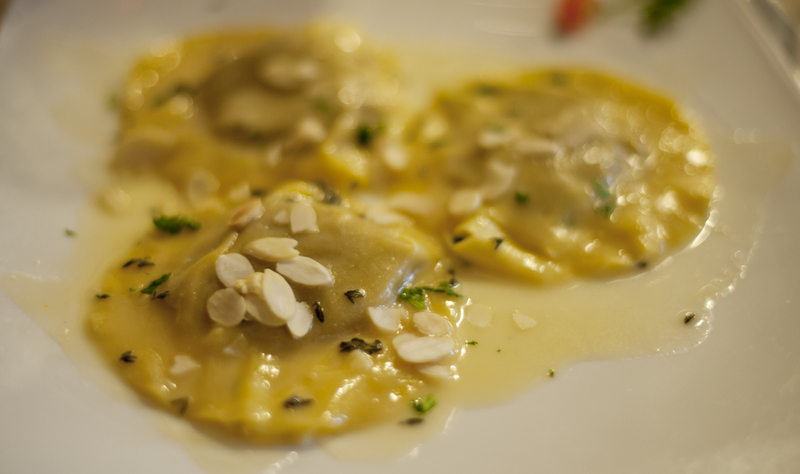 This one suggested fresh duck ravioli with compliments from the chef. I was not disappointed, although my judgement may have been impaired because, in addition to the wine that I ordered with my meal, the waiter insisted on bringing me a complimentary spritz before the meal, and a limoncello afterwards. Shoot first, ask questions later. 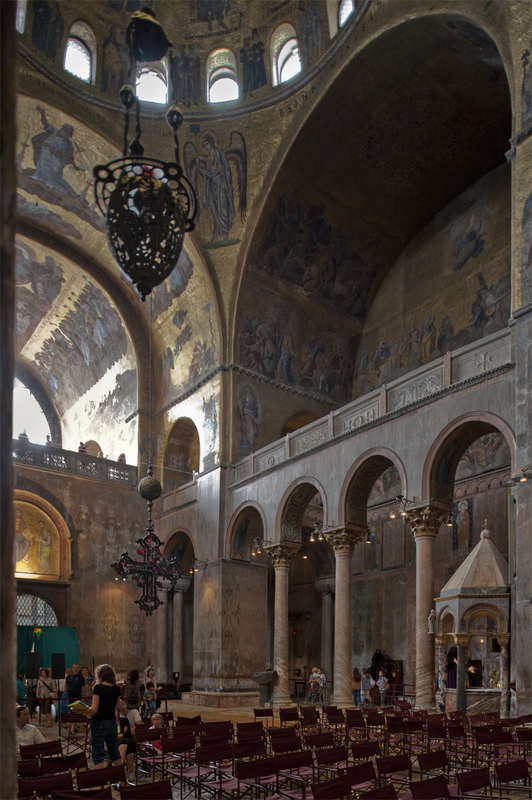 Photography is strictly forbidden inside San Marco. Although none of my discreetly captured images came out well, I figured I needed to show one for the record. 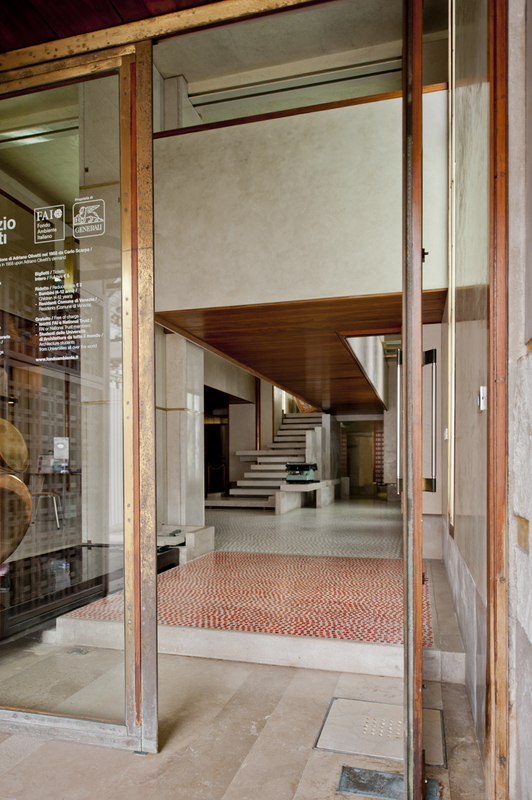 To my great joy, the old Olivetti showroom, designed by Carlo Scarpa for the beautifully-designed-typewriter company, has been recently restored, and just opened up to visitors in April. For years, it had been a cheesy souvenir art shop, and its proprietor didn't like architects poking around. 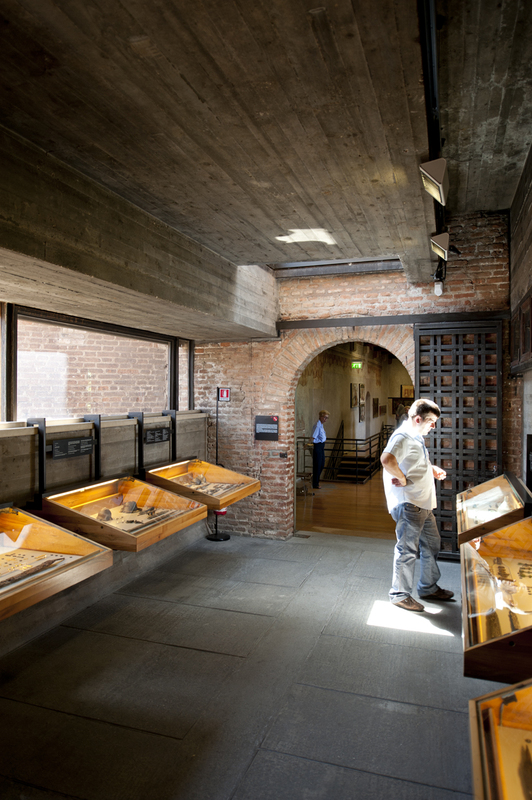 Although most people would find the entry fee to be a rip-off, Scarpa enthusiasts, and Olivetti afficionados (I fit in both of these categories) will find the tiny museum well worth the price. The original typewriters and adding machines are on display, too. 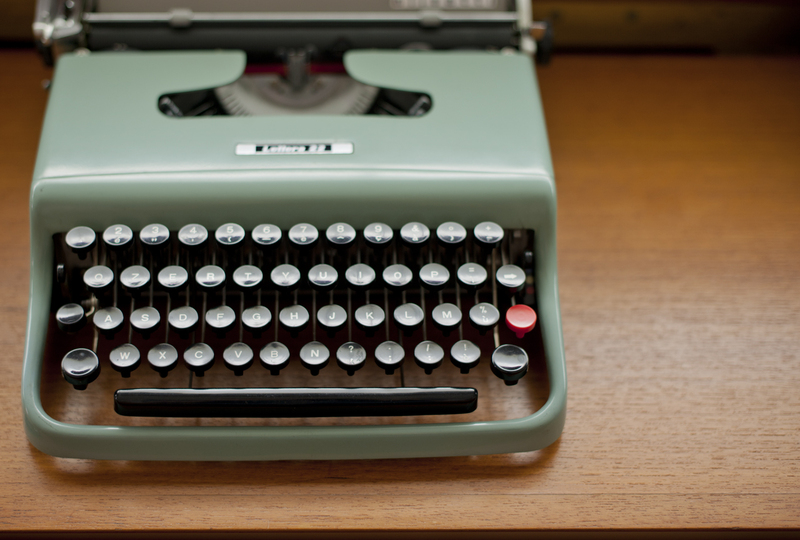 Earlier this year, I had the pleasure of discovering an old, beaten-up Lettera 22, just like this one, in my grandparents' attic. It now graces my mantle, when I am not nostalgically writing with it, and it was nice to see one in a setting designed specifically for it. 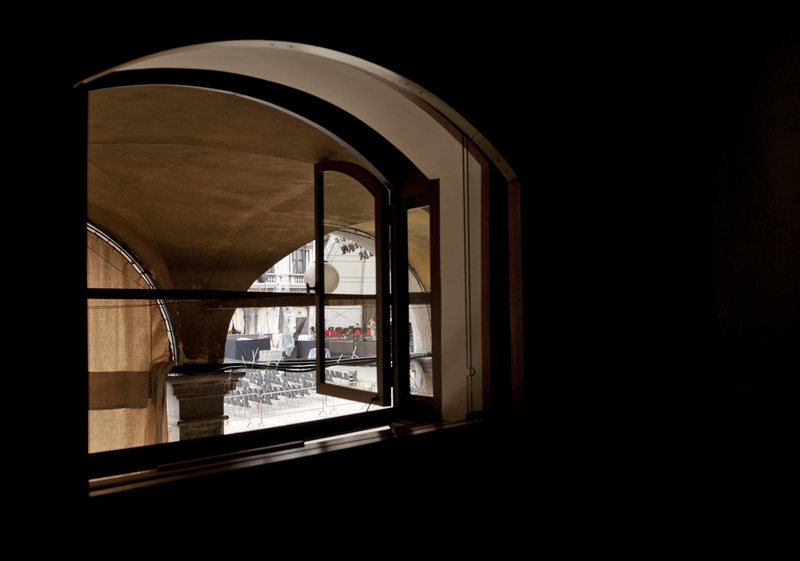 Upper level windows look out onto Piazza San Marco. The wash room is on the other side of this wall, which is provided with ventilation (and eavesdropping potential) by these teeth. A beautiful wooden door encloses the toilet room. 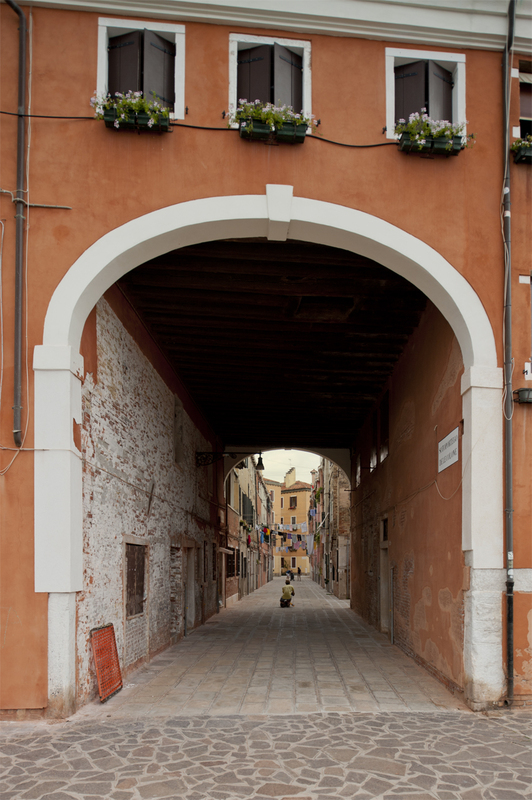 The entrance is directly off of the arcade on the piazza. From my brief observations while standing out front, most people, who carrying around their overpriced gelato, are only briefly distracted by the bizarre and ancient machines in the windows. A little touch of color. Cicheti, again. I'm going to have a hard time without the snack time to which I've grown accustomed here. 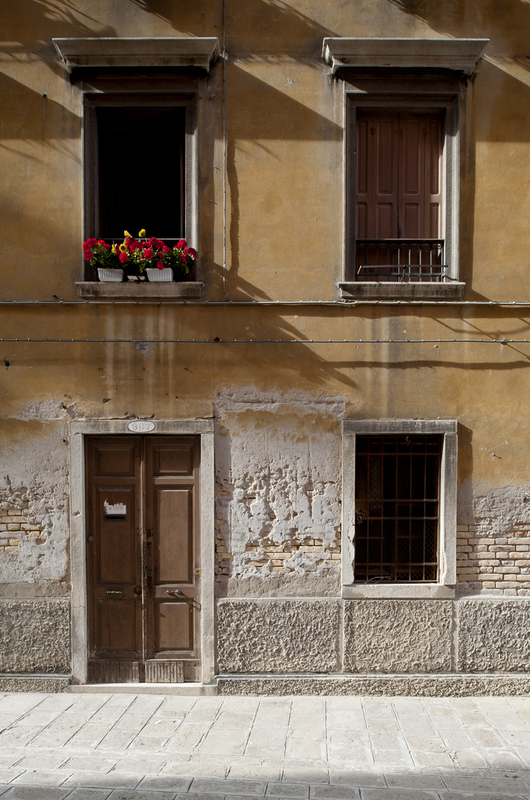 The sleepy residential neighborhoods are sometimes enlivened when locals see one another on the other side of the canal, and shout a friendly, "Ciao, Paolo! (or some other name)" across the water. Only the motorboats and the Teva sandals betray the century. If the only color provided is from pale brick, the boats make up for it. The kids were called to dinner, and this soccer ball slowly bounced to rest in this corner. This alley is far wider than the one that I showed the other day, but a scale figure is provided. The tide slowly approaches the high water mark. 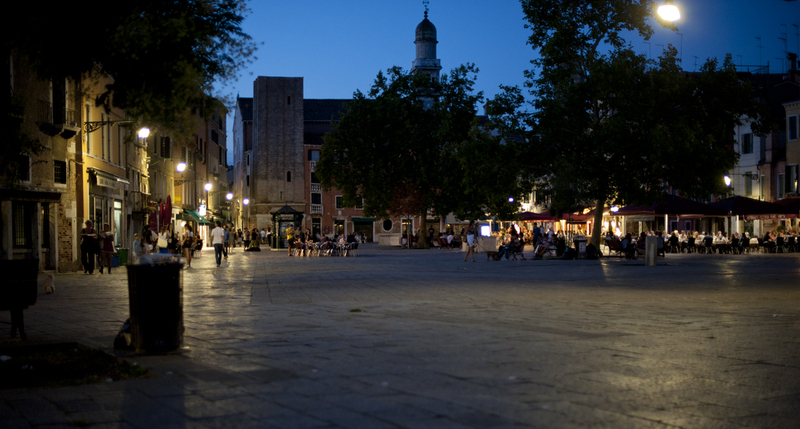 The Campo San Barnaba is a lively place to hang out in the evening. In fact, this whole neighborhood is. Not coincidentally, most of the universities are located nearby. 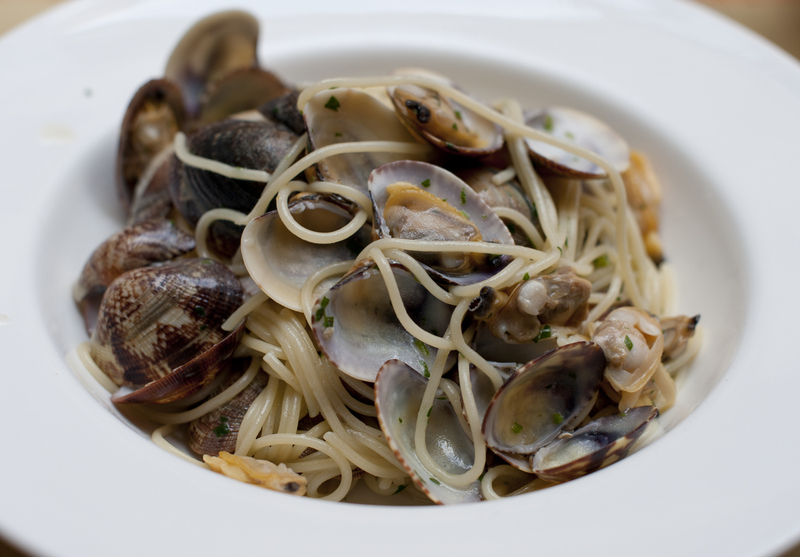 My first course for dinner: spaghetti alla vongole. Just after my plate was cleared, a loud marital argument broke out in a fourth floor apartment above the enclosed courtyard in which the restaurant was located. Without warning, a plate and fork were violently ejected from the window. Fortunately, they both happened to land without hitting anyone in the crowded eatery. About twenty minutes later, it was made audibly clear that the couple had settled their differences. 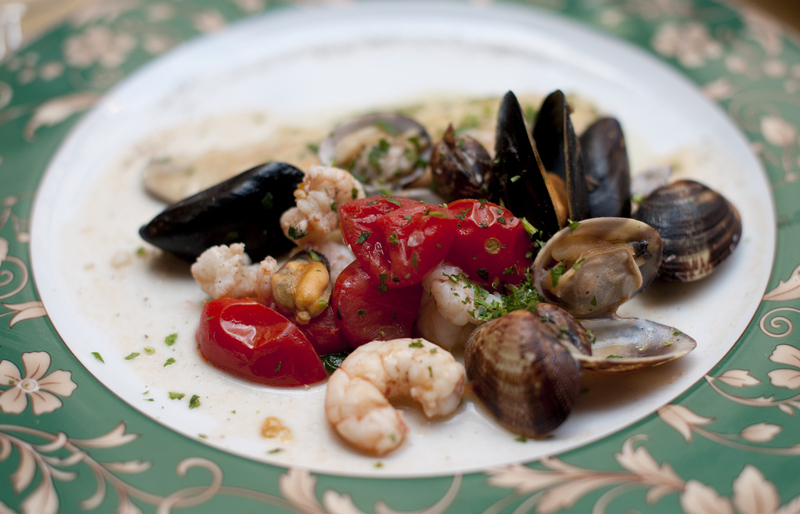 My second course: a mixture of fresh local seafood. I think this is what I ordered last night, but I finally got it tonight. The rest of the meal was enjoyed without any defenestrated silverware. 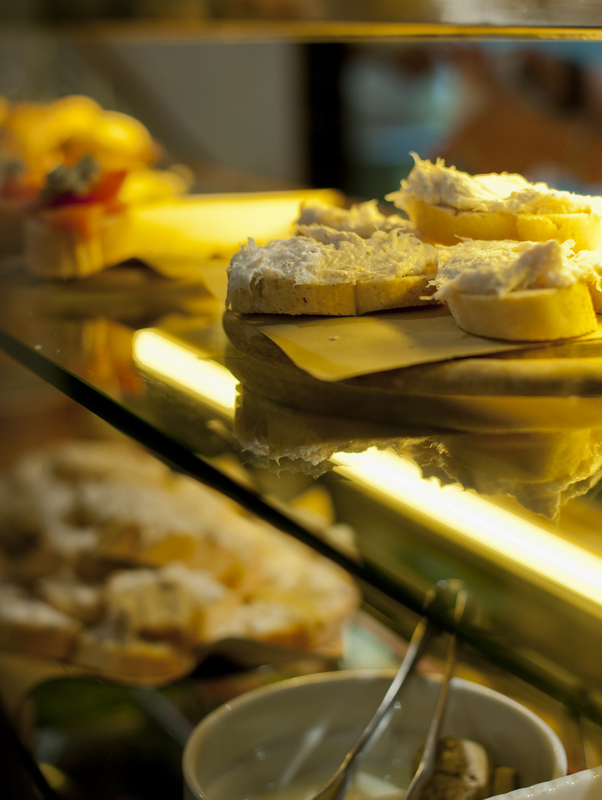 Camp Santa Margherita is full of restaurants and bars, which are very popular among the student crowd at night. My final view towards the Grand Canal on my way back to Cannaregio. 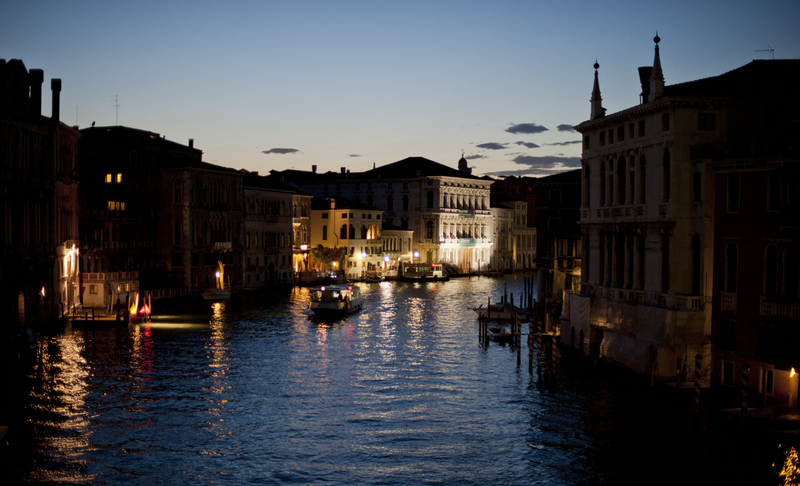 For those of you who are unfamiliar, Venice is home to the original biannual arts festival, called the Biennale. 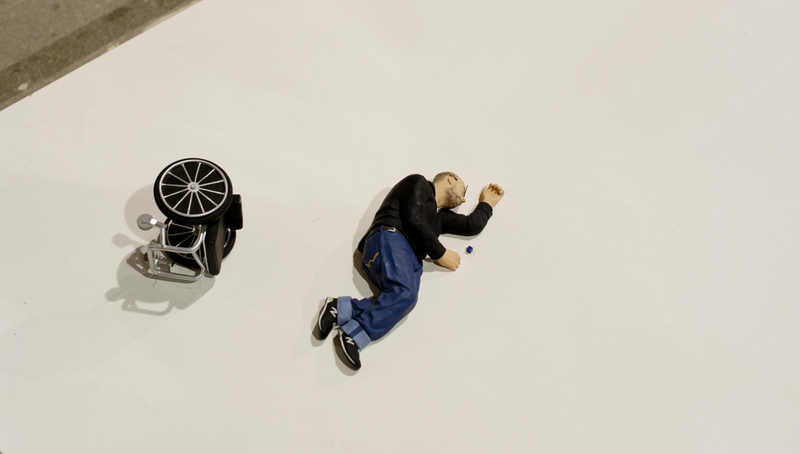 Nowadays, there’s a Biennale every year, but odd years are devoted art, and even years to architecture. This town, which has become a slave to its history, is also the setting for one of the most influential contemporary art/architecture exhibitions in the world. 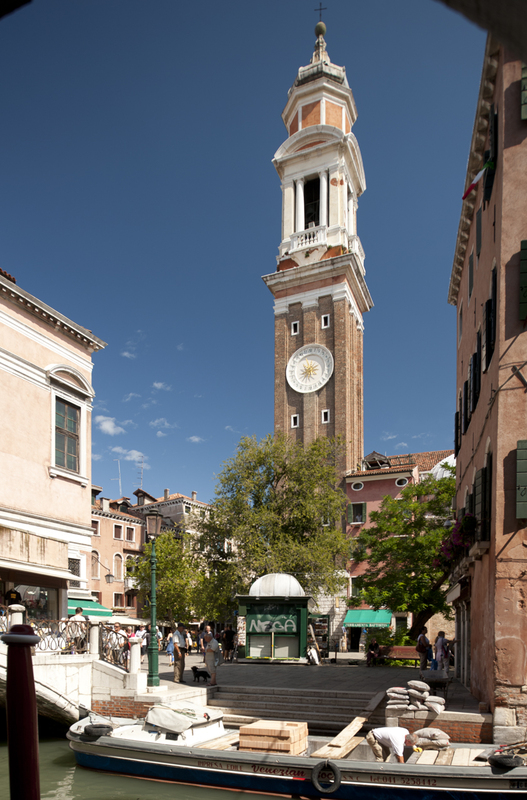 Many countries have their own pavilions in the Giardini at the eastern edge of Venice. 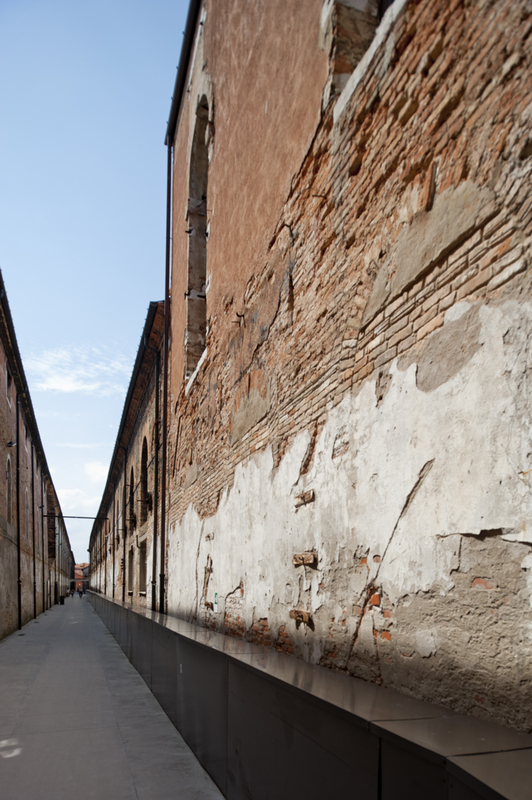 There are a few other venues around town, too, most notably including the Arsenale, the former ship-building and naval complex, which hosts larger exhibits that are curated around the theme of the year’s exhibition (ILLUMI-nations, currently). This, of course, is an art year, and I was excited to spend the day roaming around the Arsenale and Giardini, checking out the various national pavilions, and assorted other exhibits. For me, the highlights of the Arsenale were an installation by James Turrell (described below), and the film, The Clock, by Christian Marclay. The film is a 24-hour compilation of scenes from movies where clocks can be seen, or time is mentioned, in real time, and for a cinephile like myself, it’s pretty hard to pull oneself away. There are a bunch of photos from the Giardini below, but some additional highlights included a Cindy Sherman room, and another Pipilotti Rist room (this one was much more reserved than the installation in Istanbul). For the first time since leaving the mountains of Kyrgyzstan, I encountered some rain this evening, and after countless dry, sunny days, I’m still getting used to the idea that the weather can actually change. 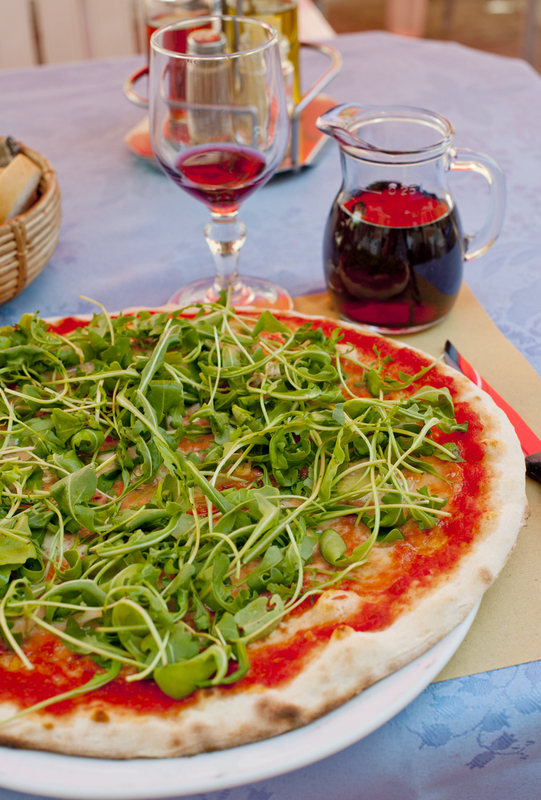 Although this is hardly an authentic venetian meal, I was craving pizza, and this was a good one. The wine didn't hurt the lunch, either. I started my Biennale day at the Aresenale, where I found this little piece. 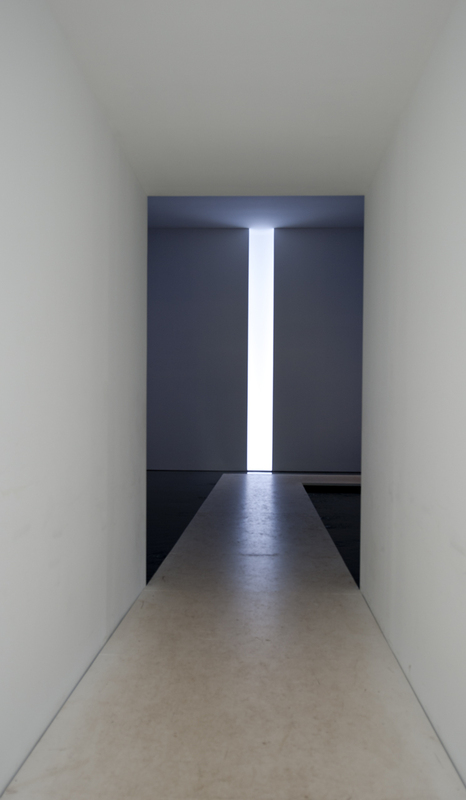 The Arsenale also featured an installation by James Turrell that was truly mesmerizing. Three at a time, visitors were allowed to put on special clean shoes, and ascend up a set of stairs, entering a hole in the wall that was defined by color. The interior space had no corners, but a gradual ramp that led to a shear drop off with no edges. A gradually changing colored glow enveloped the space, and the intensity of the color was both shocking and disorienting. Although there were no special effects, a fog seemed to be emanating from the hole, but this was just an optical illusion. Obviously, photos were not permitted, and I don't think they would have helped, anyway. This is the long passage outside of the exhibit space. 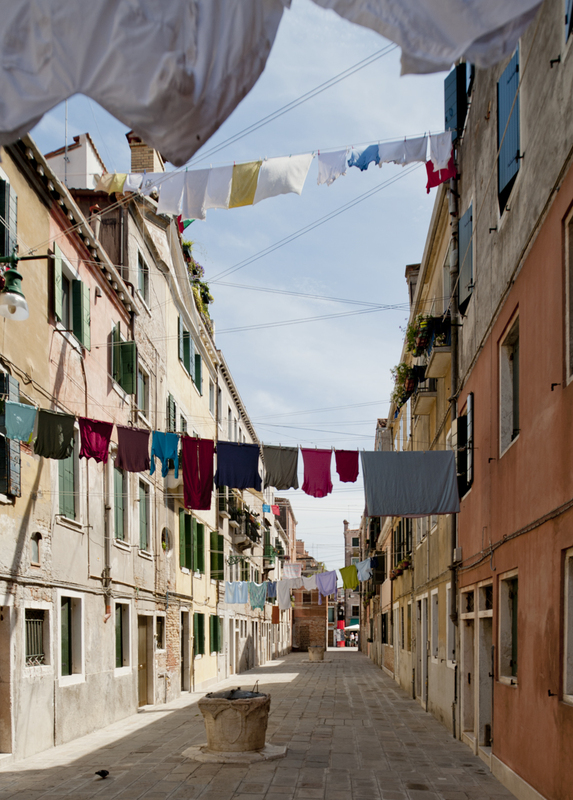 I wonder what it's like to live in a place where everyone knows the color of one's undergarments. 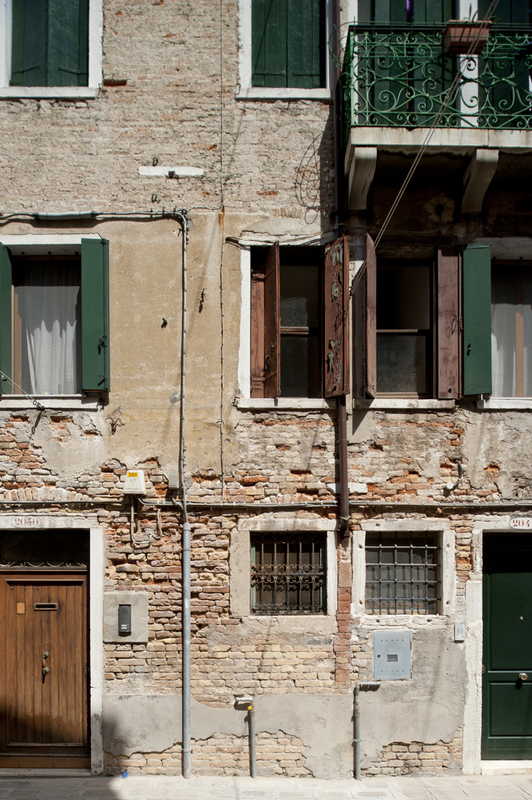 The facades of some Venetian houses are like archeological digs in progress, showing all the layers of construction and renovation. 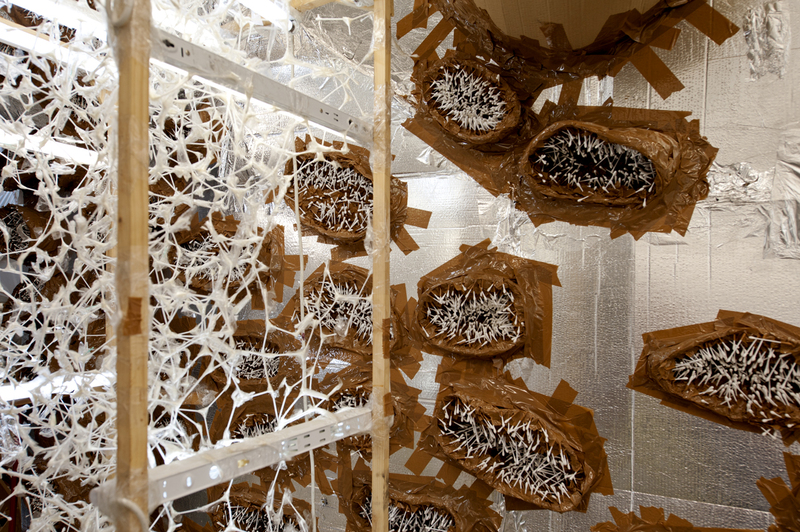 A view of the Q-Tip section of the bizarre installation in the Swiss pavilion, by Thomas Hirschhorn. 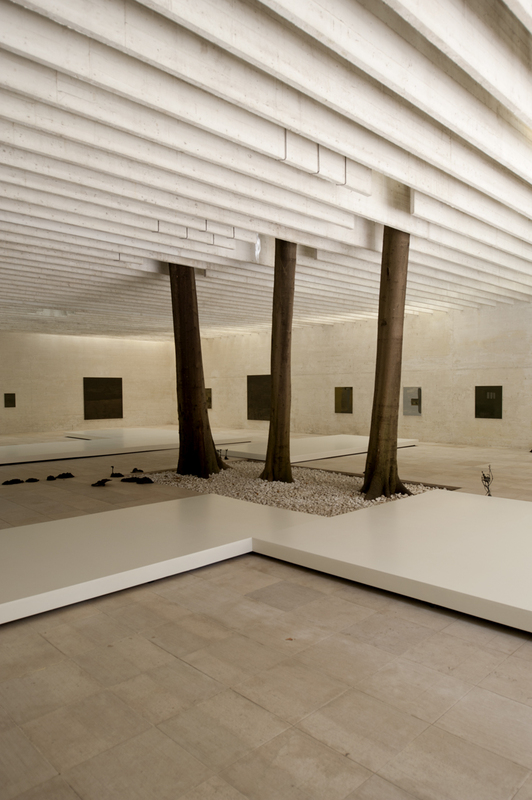 I have always been inspired by Sverre Fehn's Nordic Pavilion. 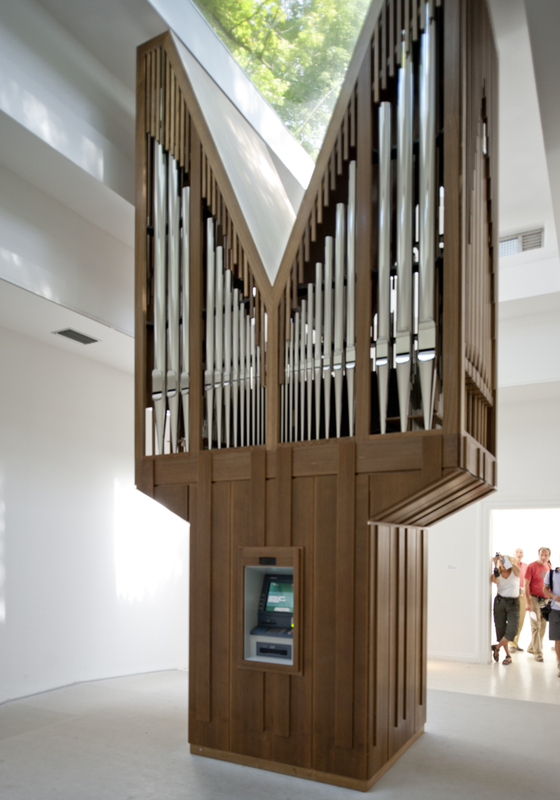 The American Pavilion featured a working ATM/pipe organ, by Allora & Calzadilla. When cash is withdrawn, a room-shaking church chord is played.The installation in the Austrian Pavilion included a maze-like structure that was suspended about 3 feet off the ground, by Markus Schinwald (also in the image at the top of the page). Josef Hoffmann's design of the Austrian Pavilion still seems current 80 years later. The interior of the Greek Pavilion, by Diohandi. 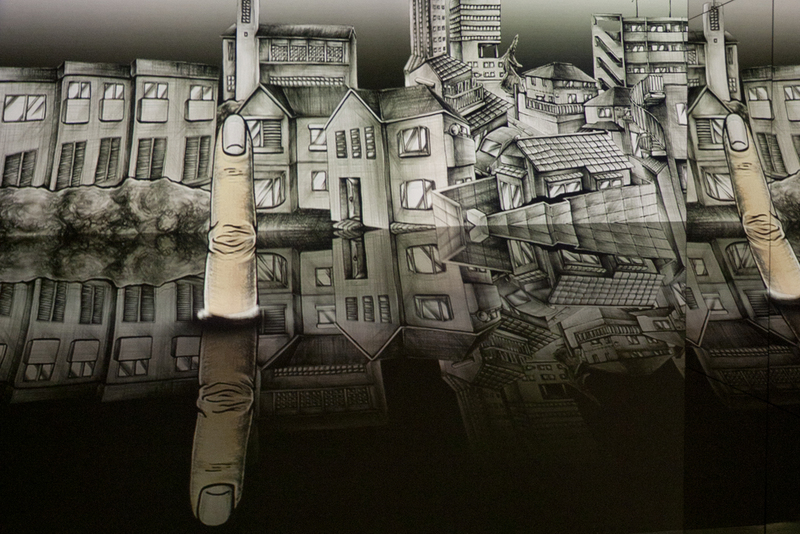 The Japanese Pavilion featured an animation by Tabaimo that was projected in every direction, in a room full of mirrors. 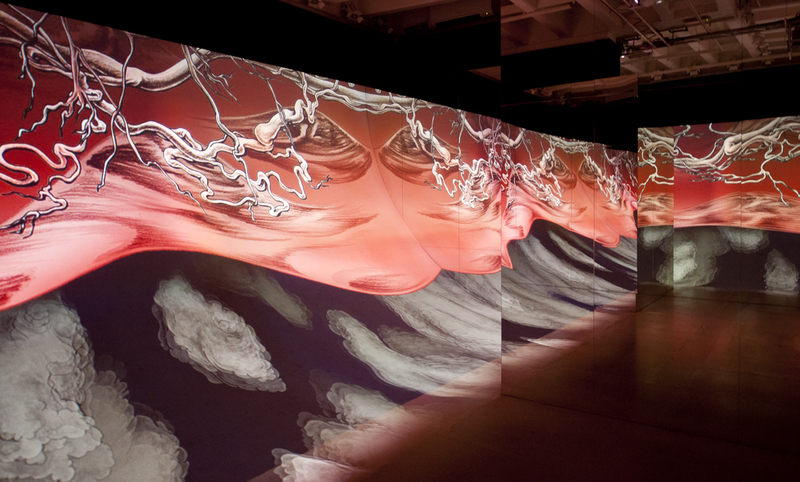 The animation, and the whole experience, for that matter, was enveloping, and I have no idea how long I stayed inside. I only know that I was asked to leave at closing time. 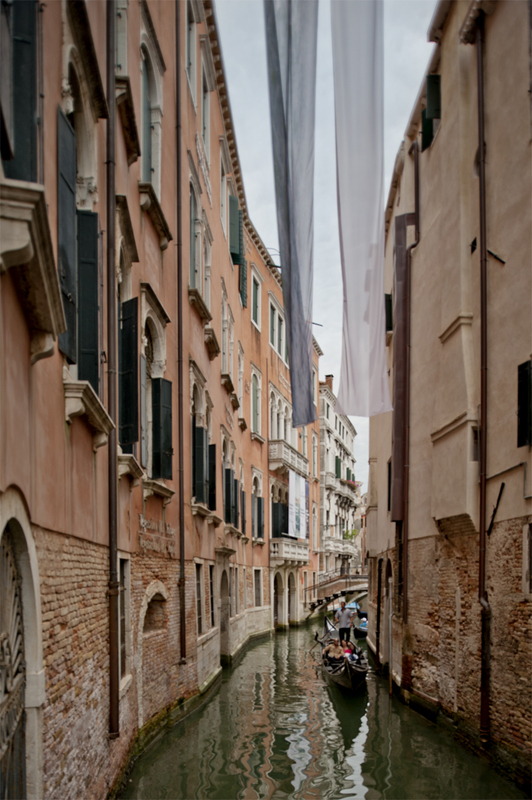 When I emerged from the Biennale's gardens, I discovered that the weather had changed. For the first time since leaving Kyrgyzstan, I was faced with the potential for rain, and a poor evening for photographing. One of the larger sotoportegi. The weather was looking ominous, as I made my way back towards the center of the city. I made the decision to have dinner near my hotel, which turned out to be a good decision, because the skies opened up shortly thereafter. Yes, that tower's leaning. 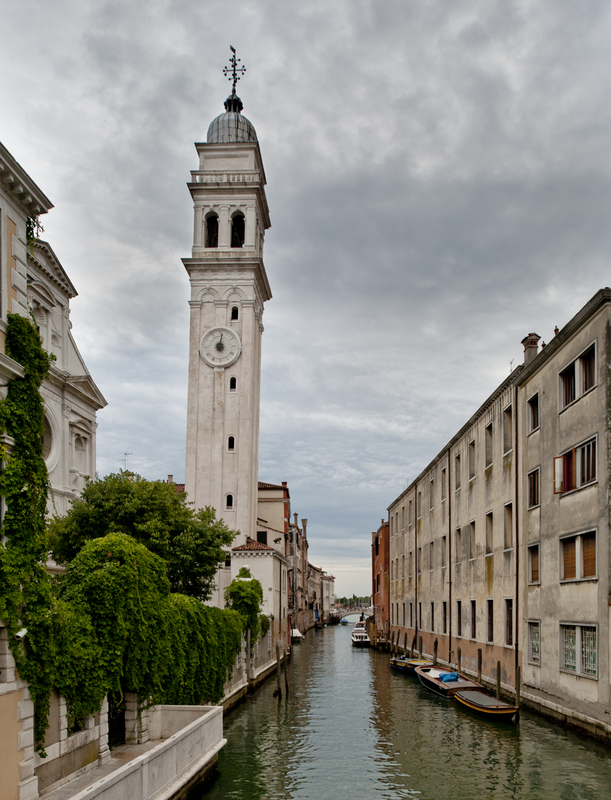 It's the campanile of the Chiesa di San Giorgio dei Greci. 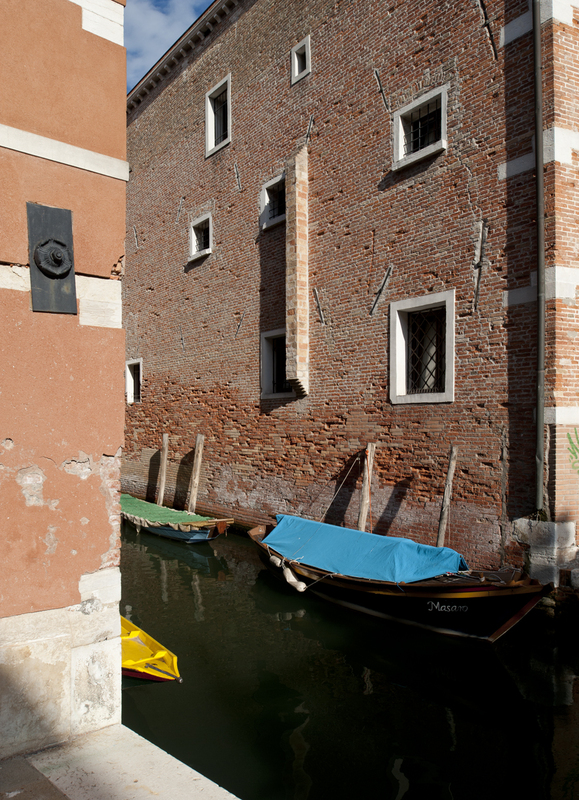 A gondolier emerges from beneath Carlo Scarpa's bridge in front of the Querini Stampalia. I'll be back here tomorrow to spend some time in the garden. 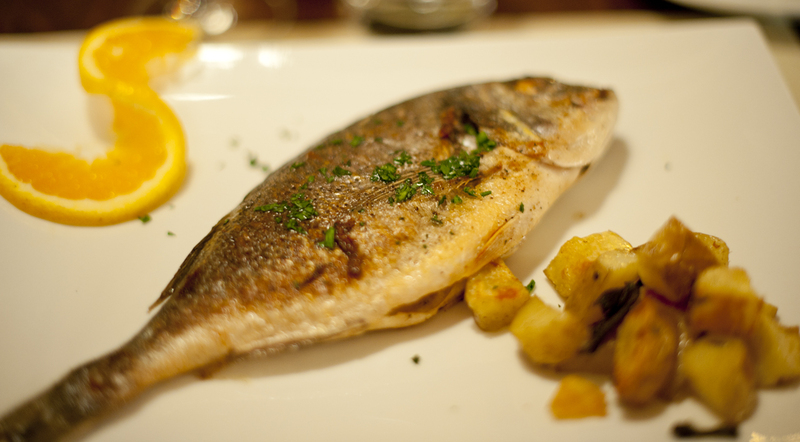 I stopped at another small Osteria for Cicheti on my way back to my neighborhood. I could get used to the idea of Venetian happy hour. 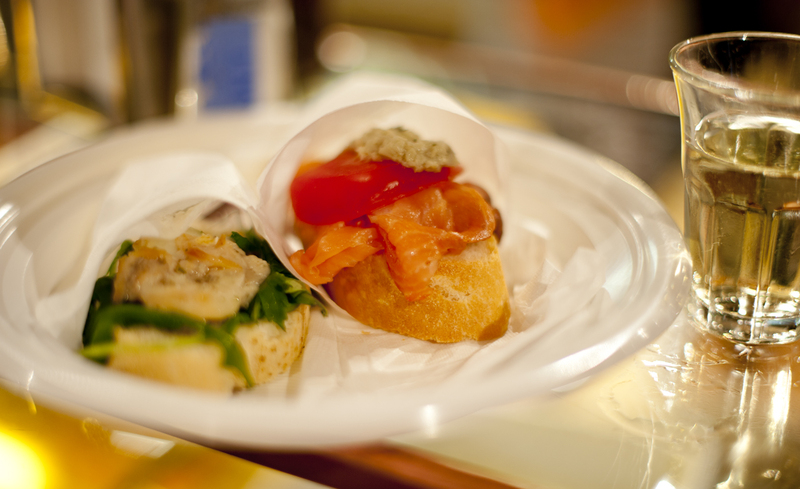 Cicheti and wine before dinner is not a bad way to start an evening. 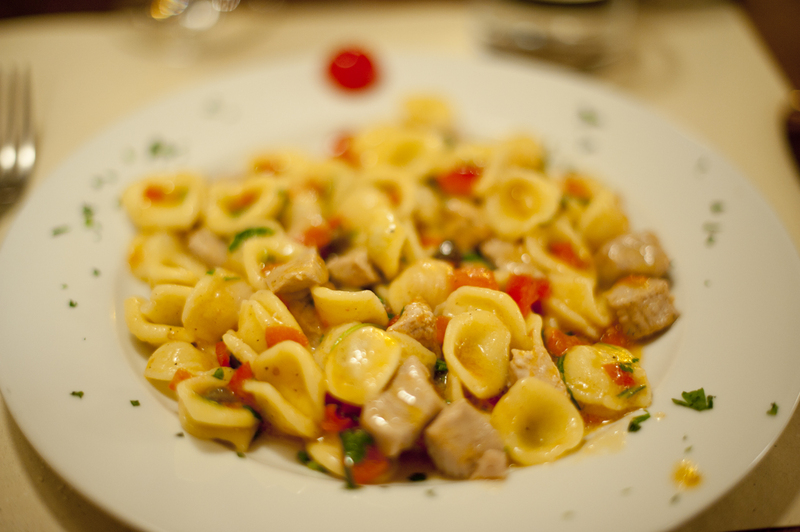 At dinner, which happened to be in an alley very close to my dungeon of a hotel, I started with my waiter's recommendation of pasta with tuna. I'm almost positive that this is not what I ordered. My waiter and I discussed a couple of his recommendations, and I'm pretty sure that we settled on a mixed seafood plate. Another waiter handed me this, and walked away. After scratching my head for a moment, I decided to dig in. About 30 seconds later, I saw my waiter heading towards me with a plate of seafood, but when he saw me eating this, he quickly turned around. I didn't mind, however, because this was fantastic, and I was able to practice my newly learned filleting techniques. The streets were soon rain-soaked, and outdoor diners were forced to huddle beneath meagre awnings. 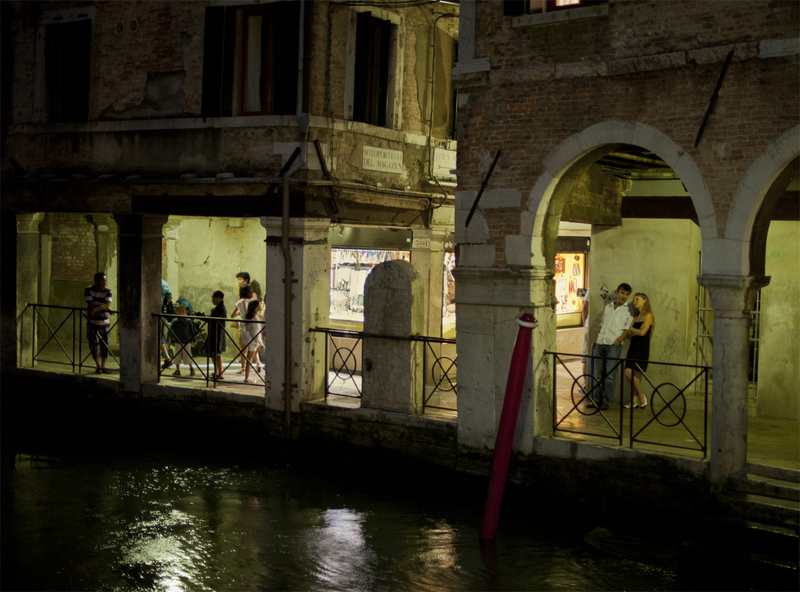 Taking shelter in a sotoportega is a good opporunity to make a romantic connection. 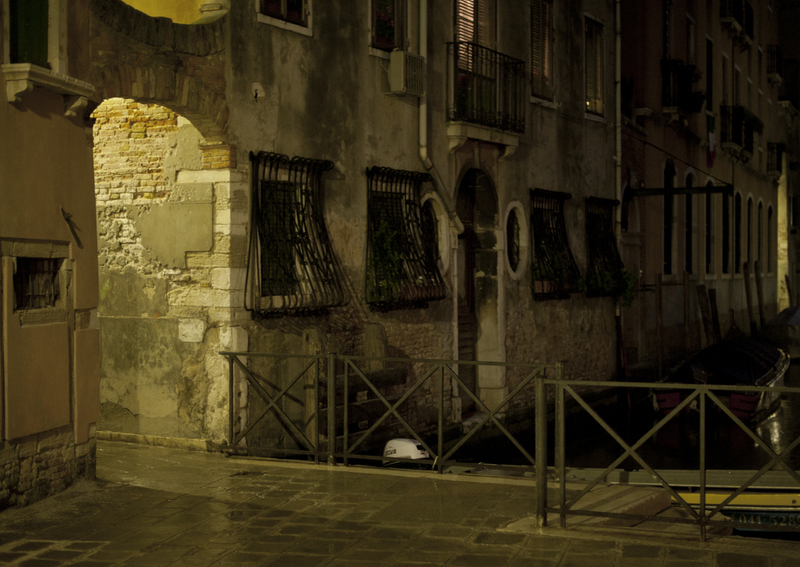 The streets in Canareggio were soon deserted, and I had to rush to get back to my room before being completely drenched.